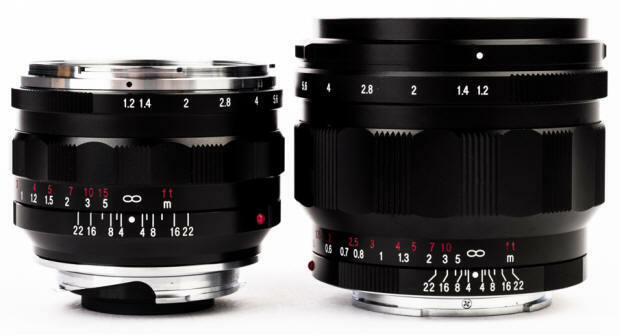 NEW Comparison Voigtlander Leica Mount Lens Chart! 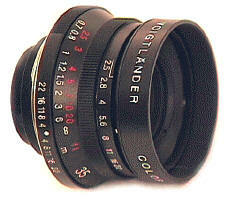 ONE PAGE Listing ALL Cosina Voigtlander Leica Mount Lenses - in Production or Discontinued! FREE NEXT DAY USA Shipping ON ORDERS OVER $599! Orders received by 3 PM California time Mon-Sat usually shipped the same day. 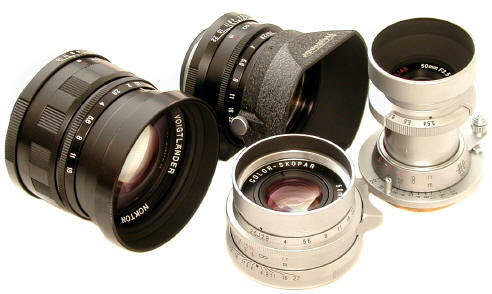 ALL Voigtlander Leica Mount lenses mount safely on ALL Leica M Mount cameras ! Voigtlander's 10mm f/5.6 Leica M-Mount is the world's first 10mm rectilinear (distortion free) 10mm lens for any full frame camera! Size Comparison: 10mm, 12mm, 15mm viewfinders. With its large exit pupil, the 10mm brightline finder has an exceptionally clear view. Next Day USA Delivery to most lower 48 locations by USPS Express Mail. Orders received by 3:00 PM California time Mon-Sat usually shipped the same day. Version II is discontinued, replaced by Version III, but some are still in stock while supplies last! In use the new Voigtlander M mount 12/5.6 handles better than the screw mount version, and of course now offers rangefinder coupling and can easily use filters - without the filter adapter necessary on the earlier screw mount version. The new 12mm viewfinder is much improved with a brighter, easy to see image as well as a brightline. On the other hand, the screw mount 12/5.6 is usable on screw mount cameras - something not possible with M mount lenses. 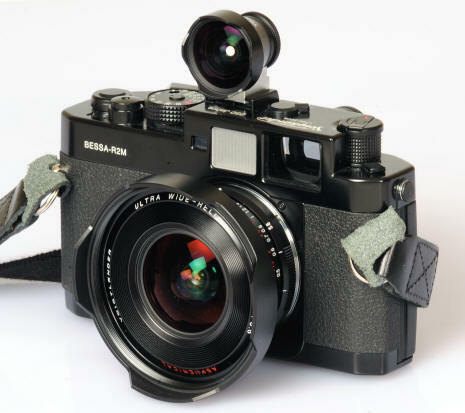 Leica Screw Mount -- add Screw Mount adapter for perfect compatibility Leica M cameras! For ANY Leica Screw Mount or Leica M mount camera! Screw Mount 12/5.6 and new improved version 12mm viewfinder mounted on Leica IIIc K. While the screw mount version can be used on M mount lenses with the screw mount to M adapter, remember M mount lenses can not be adapted to screw mount bodies! 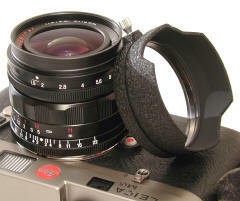 March 2000, Voigtlander announced the 12/5.6 in Leica Screw mount. When introduced the 12mm was the widest production super wide ever made for 35, a rectilinear lens, not a fish eye! It went on sale in Japan Sept 1st 2000. The phenomenal 121 degree field of view Aspherical 12 has 10 lens elements in 8 groups, f/stops from 5.6 to 22 with half click stops, and weighs only 6 1/2 oz with lens shade and front cap. While not rangefinder coupled (there is no need for it in a lens this wide), you have easy fast focusing from 12" to infinity with the handy dandy focusing lever. The finder is of robust all metal construction, offering a sharp bright image, and weighs in at 3 oz. It's probably a good idea to keep the lens shade on unless you are using the 77mm filter adapter, since with the shade removed, the front element protrudes beyond the lens barrel. The huge glass front of the finder also protrudes beyond the finder base. 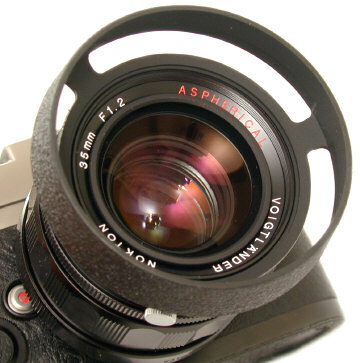 The 12 finder itself is aspheric and difficult to manufacture. 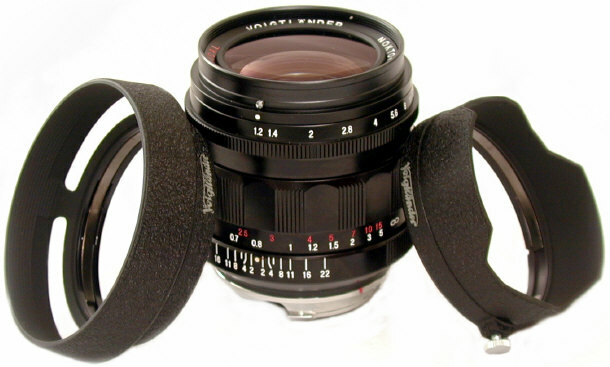 Voigtlander sells separately a lens case with top and bottom compartments. 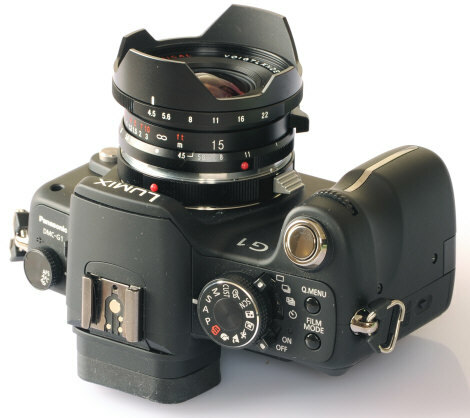 In September 2003 the SL 12/5.6 was introduced in Nikon F mount for mirror lock up. SEE PICS If you want to convince your experienced rangefinder friends that you are a rangefinder newbie, just ask them if the 12 needs rangefinder coupling. 2009 UPDATE: The screw mount 12/5.6 was replaced by the M mount 12/5.6 with the same optics. While the newer M mount has rangefinder coupling and mounts filters without a filter adapter, the screw mount version has some advantages too: 1) can mount on screw mount OR M mount cameras (M mount can not be adapted to screw mount cameras) 2) lighter and roughly half the size of the M mount version 3) available in silver or black (M mount black only) 4) the RF coupling of the M mount makes no difference when lenses are adapted to the other cameras like NEX, M43 or other so called mirrorless digital cameras. To put the 12/5.6 Voigtlander in perspective, the widest previous production lens was the now discontinued manual focus 13/5.6 Nikkor for Nikon SLRs, which sells in the used market for about $8000. 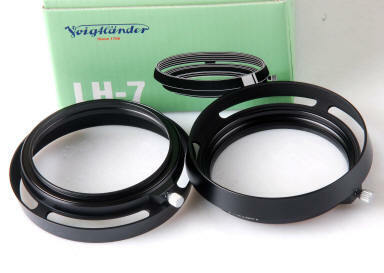 It's worth saying that as the most expensive Voigtlander screw mount lens, the 12/5.6 and its finder seem to be made to a higher level of workmanship than Voigtlander's previous, less expensive offerings. It is also the best 12mm rectilinear lens ever sold to the public, since it is the only full frame 12 ever commercially produced. Shown here is a beautiful Shintaro painted Leica M3 in modified M3 case with snap off top, mounting the 12/5.6 with filter adapter and polarizer, with VC I meter on double accessory shoe. Second shot shows Leica M3 with the 77mm filter adapter, spirit bubble level, and double accessory shoe. The top of the filter adapter is cut out, as it intrudes into the bottom of the finder area. 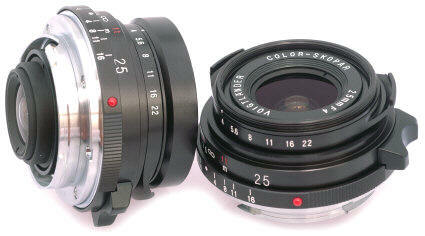 The filter holder itself is another triumph for Cosina-Voigtlander. The previous 13/5.6 Nikkor ultra super wide angle king could only take 4 fixed rotating filters, without the versatility of mounting ANY front mount filter. The now discontinued "sprit level" is a unique bubble level, marvelously designed to be the best 35mm bubble level ever made. It's stoutly made of metal with a black crinkle finish, offering both direct and optical leveling. Notice the bubble is easily visible from all four sides, allowing the photog to level the camera quickly even if they are not behind the camera. Unlike standard bubble levels, the best view of the bubble is though the rear eyepiece, designed so that the shooter can look though lens finder and the bubble level SIMULTANEOUSLY. The fixed mount of the bubble level is angled towards the presumed side by side wide angle finder for the photog's convenience. Geez, it's amazing what can happen when the chief designer (Cosina's President Mr. Kobayashi) is an experienced photog. While introduced with the 12mm lens, the new bubble level can be used with practically any lens, whether mounted in the accessory shoe of your SLR or on your Rangefinder. 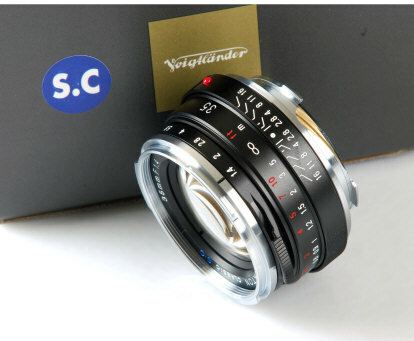 Designed with maximum versatility in mind, this ingenious level is usable not only with other 15, 25, 28, and 35 Voigtlander wides, but also with other makes of rangefinder cameras and their lenses from such places as Wetzlar and Solms. Field of view is 110 degrees. F/stops 4.5 to 22 with click half stops, close focusing to an amazingly close 11 3/4 inches, weight an astounding 4 oz, diameter 49.6mm, length extending from body 30.7mm, built in lens shade, multi-coated 8 elements in 6 groups, 10 aperture blades, push on lens cap goes over outside edges lens shade, shares same lens cap as 25. The 12/5.6, 15/4.5 and 25/4 are not rangefinder coupled, but then you don't need RF coupling with lenses this wide. Depth of field is so immense, you will have no trouble getting sharp shots with your built in your head Guess the Distance focusing device. You can use filters, but only if they are much larger than the lens, such as gelatin filters and say, 72mm filters. Play a around with it, whatever works, works. You will have to tape it, or more likely, hold the filter in front of the lens during the exposure. Another option is using the 12's 77mm filter adapter. The 15's barrel is a bit smaller, wrapping some electricians tape around the lens barrel will allow you to mount the clamp on 12's 77mm filter ring. If you want to convince your experienced rangefinder friends that you are a rangefinder newbie, just ask them if the 15 needs rangefinder coupling. The original plastic bodied 15 viewfinder supplied with the 15/4.5 screw mount has a easily used clear view without framelines. 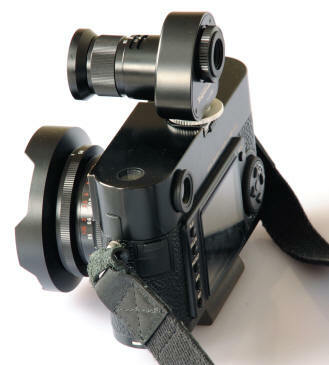 In 2009 an improved metal 15 viewfinder was introduced, which 15 screw mount owners may purchase separately. See section below on the 2009 M mount 15/4.5. The screw mount 15 shares the VL-1 lens case, with its upper compartment for the finder and the lower compartment for the lens, with the 21, 25, and 35 Compact lenses. The VL-1 does not fit the later M mount lenses. 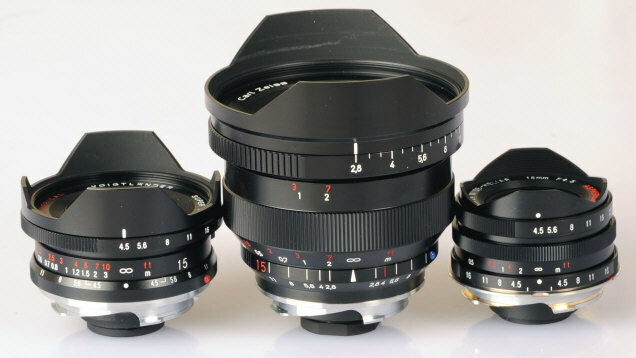 Left to right, a complete 12/5.6 outfit: the optional 77mm filter attachment, the detachable lens shade, the 12/5.6 lens, the optional double accessory shoe, the 12mm finder, and the optional bubble "spirit level." Contrary to rumors, the spirit level does not measure the photog's Karma to determine if the photog is worthy of the lens. 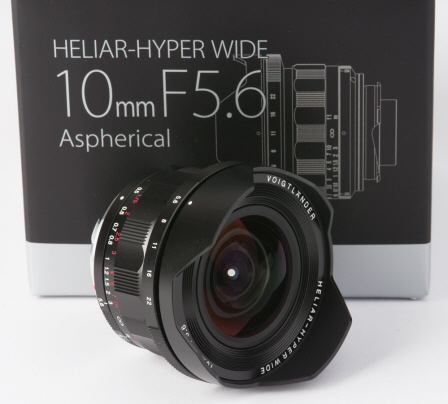 Voigtlander SUPER WIDE-HELIAR 15MM F4.5 ASPHERICAL III !! This is the new Version III released in March 2015 to correct color problems on the Leica M Digitals and full frame Sony A7 series. 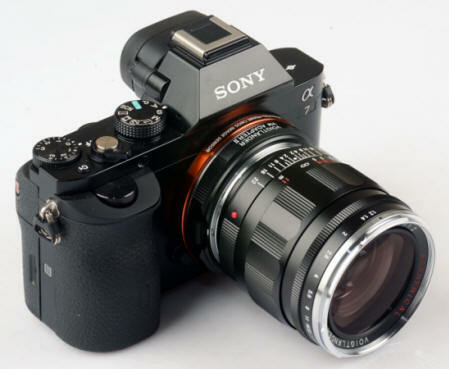 2010 Update: New improved Metal Version II 12mm $349, 15mm $189 and 21/25mm $189 viewfinders were introduced. 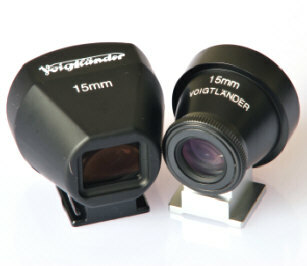 Side by Side: The Version I and Version II Voigtlander 15mm Viewfinders, $149 and $189. 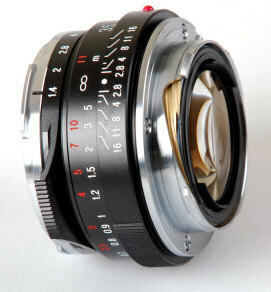 Voigtlander 15/4.5 VIII works on all M mount film cameras too! 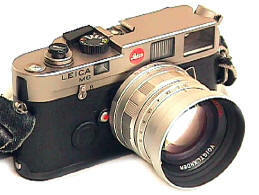 Here shown on the Leica M5. 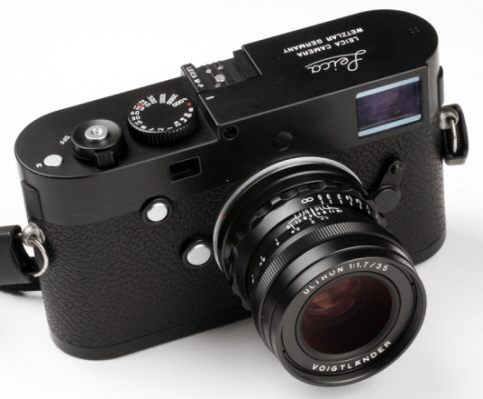 Leica Screw Mount -- add a Screw Mount adapter for perfect compatibility Leica M cameras! For ANY Leica Screw Mount or Leica M mount camera! 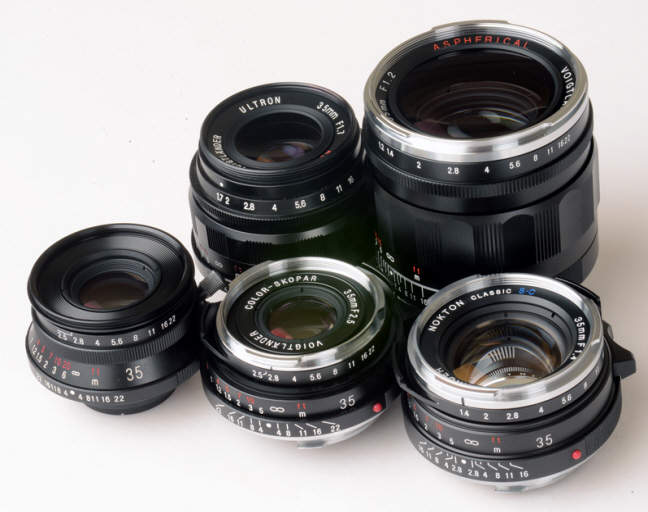 Yep, ALL of the new Cosina Voigtlander Leica Mount lenses are quite usable on the M8, MP, M7, M6, M5, CLE, CL WITH TTL metering!! "Thanks for your usual excellent service. I got the Skopar 21 and have been using on my M9 with the latest firmware. By "locking" the ISO at 160 and selecting the older 21 Leica for correction, the results are very nice. I had been wanting this lens, but thought it might only work on my film Ms, so the firmware release pushed me over the edge. I think the good reception of this tiny lens may have pushed Leica to do the new Super Elmar, but since they improved the firmware correction (for their new lens I'm sure) I'd expect also more demand for the Skopar. To the left is the new 21/4P in M mount, to the right the screw mount 21/4. The square LH-1 lens hood is optional. Remove the standard round hood to mount it. Released April 2007. The new M mount 21/4 P has the same optics as the previous screw mount 21/4, but now sports a new lens barrel. Produced primarily for the new Voigtlander R4's, the 21/4P is not sold with a viewfinder as there is no need of an accessory 25 viewfinder for the R4A or R4M. 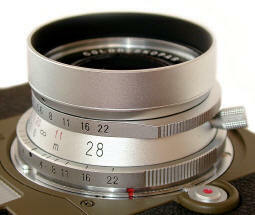 The 21/4P in Leica M mount lens brings up the 28/90 framelines in Leica M cameras. 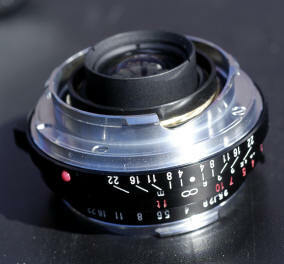 The 21/4P is styled similar to the Leica 35/2 pre-aspheric Summicron. The optional square LH-1 lens hood will fit the 21P, but the LH-1 is not suitable for the R4's as it blocks too much of the viewfinder. 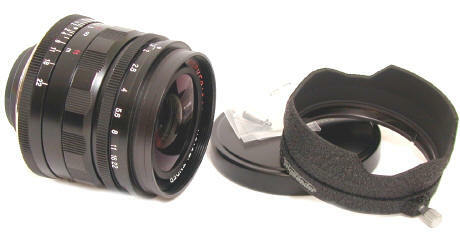 The lens is supplied with a 39mm snap on front lens cap. The 21P has 8 lens elements in 6 groups, 39mm filter size, apertures f/4 to f/22 with click half stops, nearest rangefinder coupled focus .7 meter, scale focusing from .7 meter to .5 meter, diameter 55mm, weight 144 grams or 5.1 oz, with a field of view of 91 degrees. 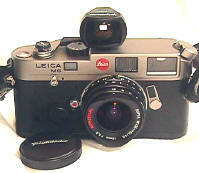 On my M6 the 21 rangefinder couples from infinity down to about 2.5 feet, but will SCALE FOCUS even closer to about 18." This closer than expected focusing is a very nice feature which can add up to interesting adventures in perspective. In 2010 two new 21 mm finders were introduced: a metal combination 21/25 viewfinder using the improved optics at $209 (chrome or black, and a combined 21/25 viewfinder using the older optics and the plastic bodied viewfinder finder (black only) $169. On top of that, the new 15-35 Zoomfinder was introduced $529. Mr. Kobayashi enjoys quality viewfinders! 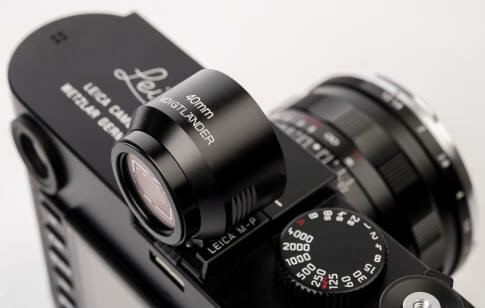 Leica Screw Mount -- add Screw Mount adapter for perfect compatibility Leica M cameras! For ANY Leica Screw Mount or Leica M mount camera! 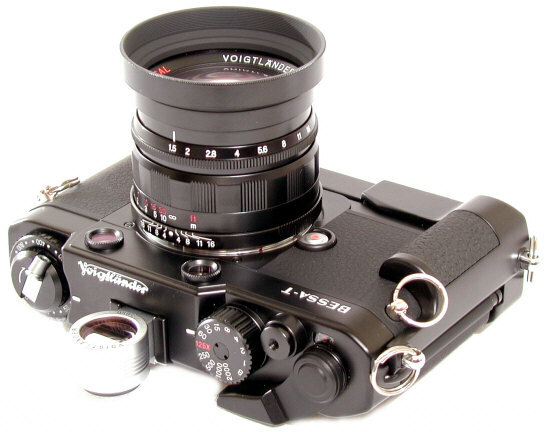 The Voigtlander Leica Screw Mount 21/4 Color Skopar has rangefinder coupling and a convenient focusing lever. 8 elements in 6 groups, 39mm front filter, built in hood. 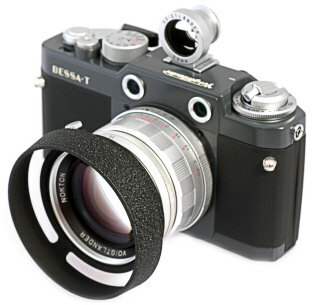 For an initial user report, see the bottom of the Bessa T page. To mount a filter, remove the shade by unscrewing it WITH the lens cap attached, mount the 39mm filter, and then remount the shade. The filter fits tightly inside the shade, and is not accessible for removal or mounting without 1st removing the shade. 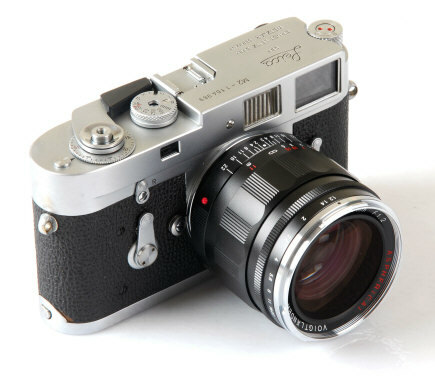 On my M6 the 21 rangefinder couples from infinity down to about 2.5 feet, but will SCALE FOCUS even closer to about 18." This closer than expected focusing is a very nice feature which can add up to interesting adventures in perspective. Perhaps the best word for the super convenient focusing lever is GREAT. The short throw of the focusing lever is also VERY convenient, you go from close-up to infinity in only about a 95 degree throw! Introduced with the screw mount 21/4 and sold with it is a very well done plastic bodied 21 brightline finder with glass optics. This superb finder, clear and bright. Yes, the finder is available separately for older 21's with not so great finders. 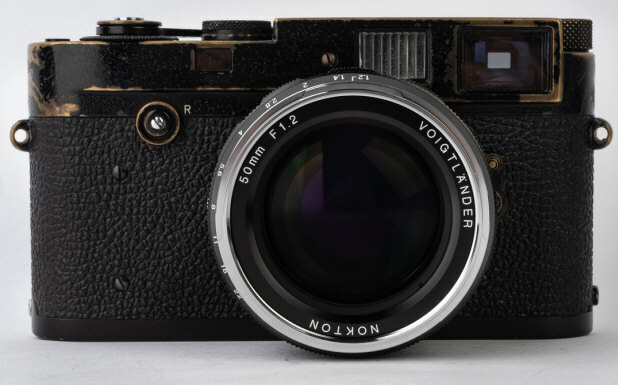 The amazing thing about Voigtlander's pricing is the new 21 with finder sells for not much more than Leica's 21 finder alone. The 21/4 shares the VL-1 lens case, with its upper compartment for the finder and the lower compartment for the lens, with the 15, 25, and 35 Compact lenses. 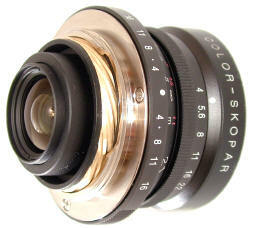 In September 2001 Cosina Voigtlander introduced a new rectangular metal shade for their 21/4 Color Skopar in Leica mount. It will also fit the 25/4 and 28/3.5 Color Skopars in Leica mount, but not the 21/4 SC Skopar in Nikon Rangefinder mount. I haven't done any tests of the standard round shade Vs the new much larger rectangular shade, but it stands to reason this much larger shade with its stepped interior will be additional flare protection. If you like to shoot against the light, or with bright light sources outside of your frame, this may well be worth a look. The new shade consists of 3 parts: the rectangular body, a rotating threaded mount, and a chrome lock screw. To remove the round hood on your screw mount 21/4, 25/4, or 28/3.5 to mount the LH-1, leave the lens cap ON the lens when you unscrew the lens hood. 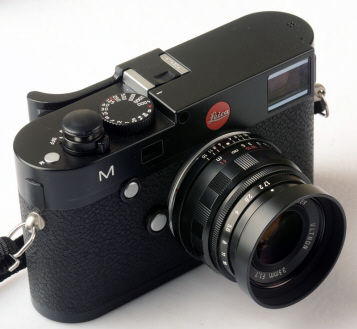 Leica M Mount -- the 25/4 in M mount is Discontinued, but still in stock! This GEM of a screw mount lens is sadly discontinued, but it lives on with the same optics in the M mount rangefinder coupled Voigtlander 25/4 P. It is a GREAT performer which approaches the images of the 10x more expensive Leica 24/2.8 ASPH, a MUCH better performer than the old and expensive 25 Canon and Nikkor lenses. TINY, small and lightweight, NOT rangefinder coupled, with LATER type of Bright Line Viewfinder, Silver or Black, screw mount (fits screw mount cameras or M mount with standard Voigtlander M adapter) I believe used prices will eventually go UP. A good argument can be made that the 24/25 focal length is the single most useful wide angle. 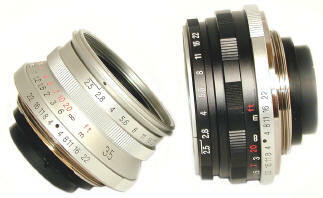 The 25/4 is the first production 25mm lens in Leica screw mount since the Canon 25/3.5 was discontinued in 1972. Personally I don't like the "Snapshot" label...the term has a tendency to trivialize an important and seriously useful lens. Unusually, it has CLICK STOPPED focusing at 1, 1.5 and 3 meters...a very nice feature. Notice the chrome tipped focusing lever -- shades of Barnack!!! The square LH-1 lens hood is optional. Remove the standard round hood to mount it. Field of view is 82 degrees. F/stops 4 to 22 with click half stops, close focusing to 23 inches, weight an amazing 3 ounces with lens shade, diameter 49.5mm, length extending from body with shade 29.5mm, multicoated 7 elements in 5 groups, 10 aperture blades, shade pushes on over the lens shade, shares same lens cap as 15. Neither the 15 or the 25 are rangefinder coupled, but then you don't need RF coupling with lenses this wide. Depth of field is so immense, you will have no trouble getting sharp shots with your built in your head Guess the Distance focusing device. To mount a filter, remove the shade by unscrewing the shade WITH the lens cap attached, mount the 39mm filter, and then remount the shade. The filter fits tightly inside the shade, and is not accessible for removal or mounting without 1st removing the shade. 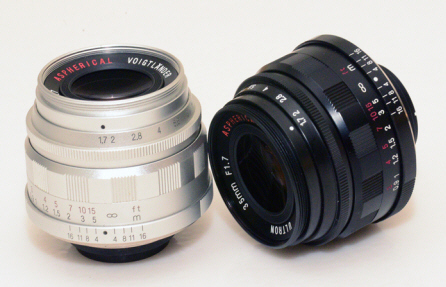 Yes indeed, the Voigtlander 15 and 25 are small compact lenses. Here are two shots of the 15 and 25 compared side by side to the compact 35/2 Summicron M (late version before the ASPH). 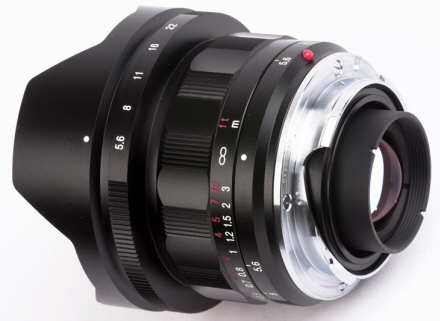 This is an improved smaller version of the 28/1.9 lens available only in black in M mount. It has a focusing tab not available on the 1.9. 46mm filter size with close focus of .7 meters. 10 Elements in 8 groups. 8.6 oz or 244 grams. Initial praise from shooters is high indeed! 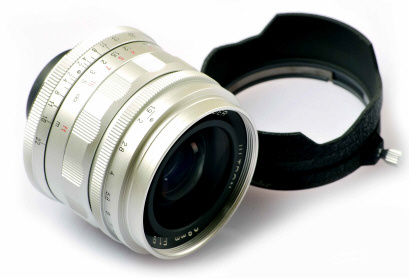 this is still a very popular lens as faster than f/2 28mm Leica screw mount lenses are very rare! Introduced at Photokina 2000, the 28/1.9 is the fastest production 28 EVER made in ANY 35mm rangefinder mount. Leica screw mount, 9 elements, 7 groups, closest focus .7 meter, 46mm filter size, chrome or black, smallest aperture f/22. The 1st shipment arrived in early May. The 28 brightline is sold separately. 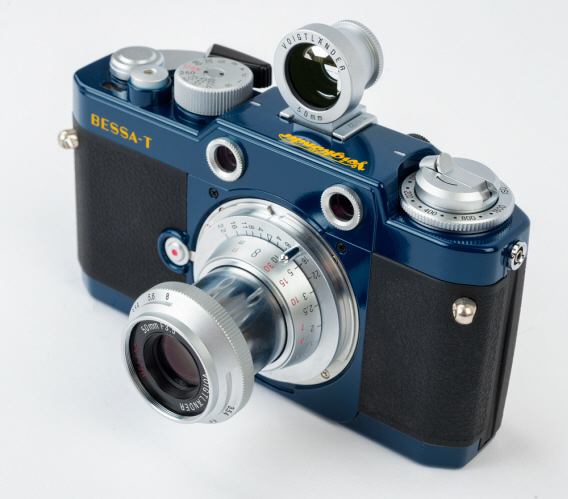 For an initial user report, see the bottom of the Bessa T page. 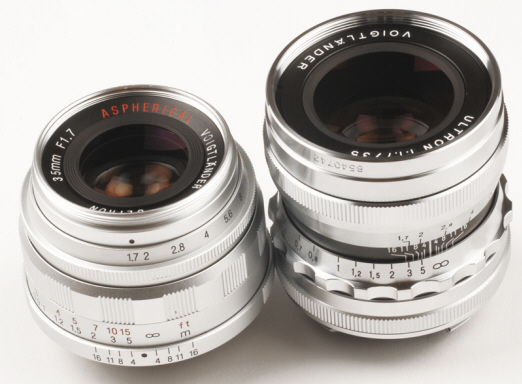 Like all Voigtlander Cosina Leica screw mount lenses, the 28/1.9 is available in either black or silver. With my M6 with .72 finder, the lens is rangefinder coupled down to about 24," a nice feature. 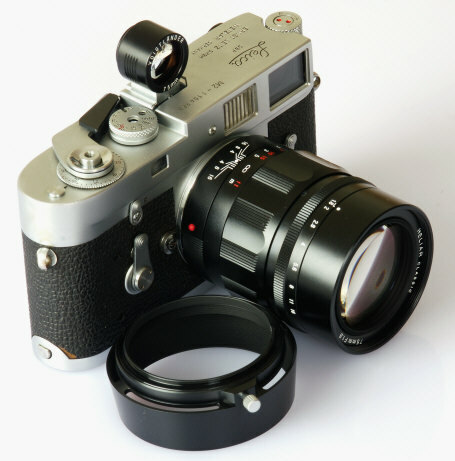 For the Leica M8 use the M8's 28mm frameline, bought up automatically with the traditional 28/90 screw mount to M adapter. For the Epson RD1 use the Epson's 28mm frameline. Notice the heavy duty removable hood, and removable focusing lever (in plastic pouch). To mount a filter, remove the shade, mount the 46mm filter, and then remount the shade. The filter fits tightly inside the shade, and is not accessible for removal or mounting without 1st removing the shade. 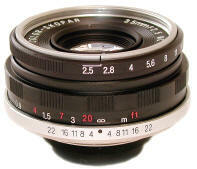 As is to be expected for such a fast lens, the 28/1.9 is one of the larger Cosina Voigtlander lenses, weighing in at 10 oz. with lens shade. It takes up about 15% of the finder with the .72 M6. The 28/3.5 was introduced in March 2002. Now discontinued it is being increasingly recognized for the great lens it is. It is the smallest Voigtlander lens. It uses 7 lens elements in 5 groups, and has a 39mm filter size. The 28/3.5 also accepts the optional LH-1 square lens shade. Notice the convex front element. Weight is 163 grams. Close focus is .7 meters. As shown in the "Wide" group shot at the top of this page, the 28/3.5 is less than half the size of the 28/1.9. To mount a filter, remove the shade by unscrewing the shade WITH the lens cap attached, mount the 39mm filter, and then remount the shade. The filter fits tightly inside the shade, and is not accessible for removal or mounting without 1st removing the shade. 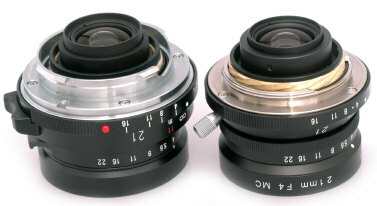 These are probably the sharpest 28mm lenses ever made in Leica Screw mount. Discontinued April 2007. The factory is sold out. 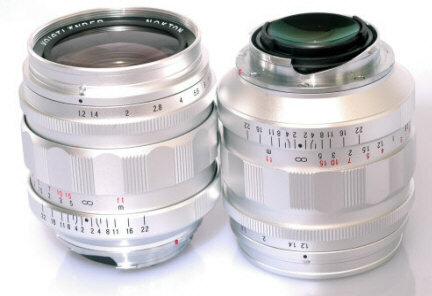 This is one of the few CV lenses whose silver version is chrome, not silver anodized. Curiously this lens was not all that appreciated while in production. Only after it was discontinued has the 28/3.5 become a sought after legend. Please note the Voigtlander SC 28/3.5 in Nikon mount has the SAME optics. The square LH-1 lens hood is optional. Remove the standard round hood to mount it. SPEED KING! FASTEST 35 EVER made for any 35mm Camera! improved performance, smaller design and closer focus! V1 & V2: V2 has a thinner smaller lens barrel (size 62mm x 60.8mm) vs. (63mm x 77.8mm), weighs slightly less (490 grams vs. 471), easier to bar code for digital Leicas, can now scale focus to .5 meter (both RF focus to .7meter - the RF limit of M cameras) different lens hoods which are not interchangeable between the two versions, same 52mm filter size. 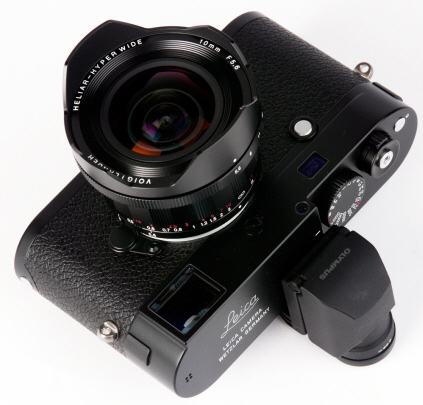 For all Leica M bodies except the M3, use the built in 35mm frameline, bought up automatically by the lens' M mount. For the Epson RD1 use the Epson's 35mm frameline. For the Voigtlander Bessa R, R2, R2A, R2M, R4A, R4M manually set the 35mm frameline. 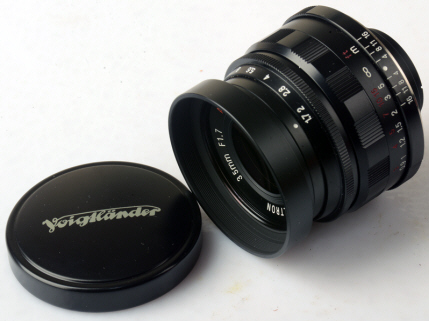 For the Voigtlander R3A, R3M try shooting the entire 40mm view. If that does not work for you, like the M3 you have a choice of the accessory 35mm viewfinder, 28/35 minifinder, or 15-35 Zoomfinder. Adapted to the various NEX, M43 and other "mirrorless" digital cameras, most shooters work with live view, but most cameras will allow you to add accessory viewfinders if you prefer them. Your choice depends upon the crop factor of the camera you are using. 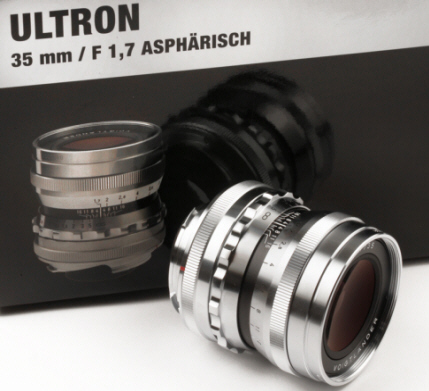 the FASTEST 35 standard production lens ever made for any 35mm camera! "The lens is incredible! No flare, barely any vignetting up to 1.4, smooth bokeh, razor sharpness. The 35mm Nokton is a truly amazing lens"
At PMA 2003 I was more than happy as Cosina's CEO Mr. Kobayashi handed me his newest creation, the Leica M mount 35/1.2 Nokton. 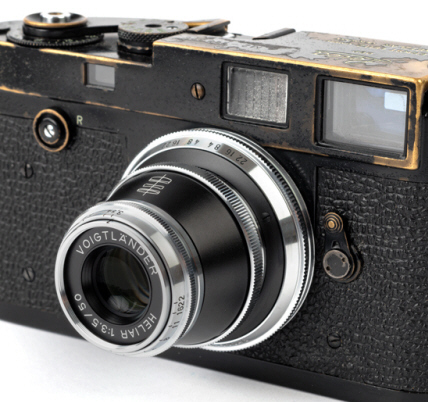 It is generating a tremendous amount of interest, from Voigtlander and Leica shooters alike. 35/1.2 Version I Voigtlander Nokton Stats: 10 elements in 7 groups, 3 elements Aspheric, f/stops 1.2 to 22 in half stops, close focus .7 meters, 52mm filters, size 63mm x 77.8mm, weight 490 grams, 63 degree field of view, 12 aperture blades, beautifully made heavy duty construction, available in Leica M mount, black only, standard non vented hood included with the lens, optional Leica M style vented hood. Handling: this is a big lens due to the fast 1.2 aperture. The focusing helical is silky smooth, with a short focusing throw from infinity to minimum focus in approximately 95 degrees. The aperture ring is also silky smooth, with full and half stop detents. Filter size is 52mm. As I am writing this on March 8th 2003, this 35/1.2 lens # 14 is one of only two on the North American Continent. The other is in the camera bag of Tom Abrahamsson for a future article in the LHSA Viewfinder. The previous 35 RF speed king lens was the Leica 35/1.4 ASPH. Will an half a stop really make any difference to you? Most of the time certainly not, but if you are a pro and that extra half a stop even brings you just one extra printable pic a year, it could make a big difference in your pocketbook if the other shooters at the event missed the shot in the low light. The 35/1.2 is very sharp while also providing extreme speed and pleasing out of focus backgrounds - bokeh. Many consider it their favorite Voigtlander lens. Tom Abrahamsson has shot the 35/1.2 extensively. He says he can see no difference between the Voigtlander 35/1.2 at 1.2, and the Leica 35/1.4 Summilux at 1.4, high praise indeed. 50/1.5 Nokton ASPH, Bessa R2, 35/1.2 Nokton ASPH with both its shades, 28/1.9 Ultron ASPH. 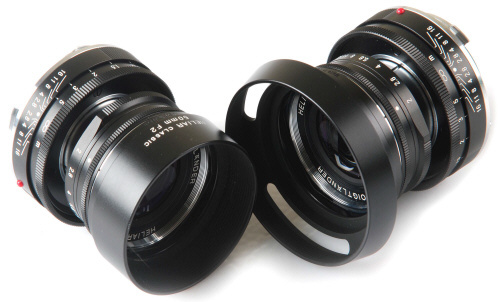 Both the 35/1.2 and the 28/1.9 are the fastest production lenses in their focal lengths ever made for any mount 35mm rangefinder camera by any manufacturer. The 35/1.2 hoods have cutouts to match up with the mounting lug on the lens. 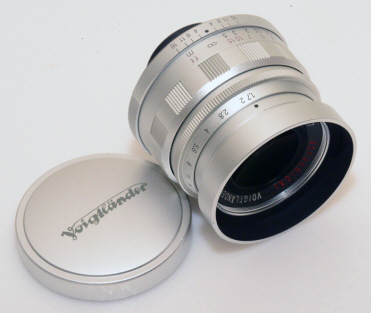 In July 2007 Voigtlander released a limited edition chrome 35/1.2. Only 300 units were produced. 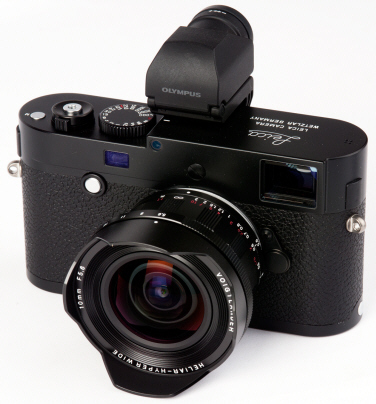 Distributors were limited by Cosina to only 40 units each to provide world wide distribution. All chrome 35/1.2's left the factory M8 modified. 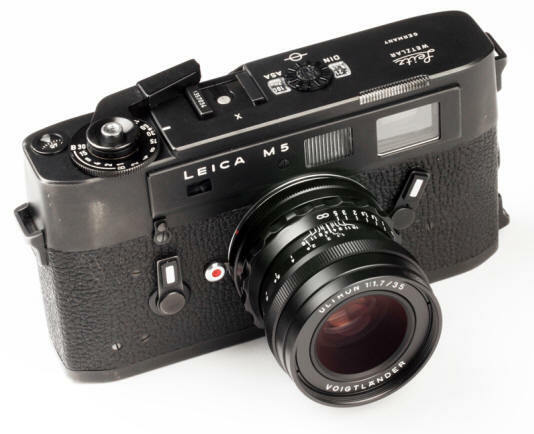 Leica M8 Update: The 35/1.2 was introduced in 2003. 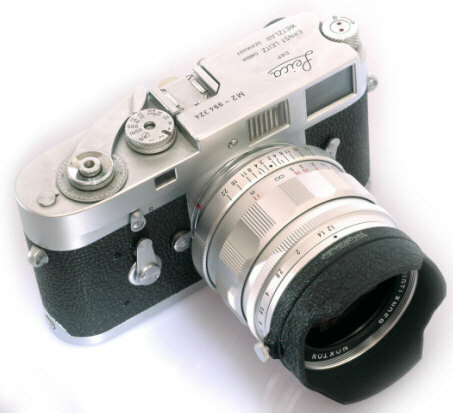 Once the Leica M8 was introduced in late 2006, some M8 owners reported focusing resistance as the lens focused near infinity. The factory determined this was caused by the rear element guard sometimes binding with the focusing mechanism, and issued a retrofit parts replacement. CameraQuest has only the later 35/1.2's V1's in stock. M8 retrofitting early V1 35/1.2's is $150 + return shipping. A part has to be replaced, and the lens checked over for focus. Average turnaround is 2 to 3 weeks after receipt. NOTE: This occurs ONLY on the VERY EARLY V1 35/1.2's! Most have already been converted. The 35/1.4 is designed for the classic 1970's look that is highly prized by many Japanese photographers. 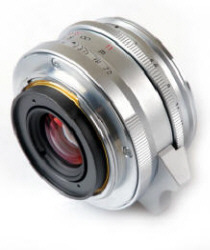 this is currently the smallest, lightest, and least expensive new Leica M mount lens available! SC or MC Versions, The SMALLEST most COMPACT current production 35/1.4 ! Single Coat SC or Multi Coat MC versions. The SC is excellent for color while giving slightly more shadow detail for B/W. The MC version gives the maximum amount of flare prevention while giving slightly higher contrast in B/W but less shadow detail. Close focus .7 meter. Available in black only, M mount only. The 35/1.4 takes the dedicated bayonet on LH-6 lens shade. Small compact size about 1mm shorter than the 40/1.4 and weighing only 25g more than the 40/1.4!! Introduced January 2008. 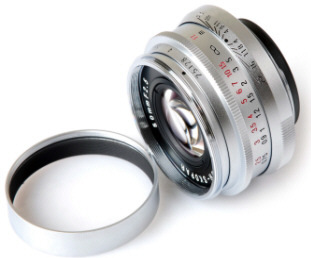 For all Leica M bodies except the M3, use the built in 35mm frameline, bought up automatically by the lens' M mount. 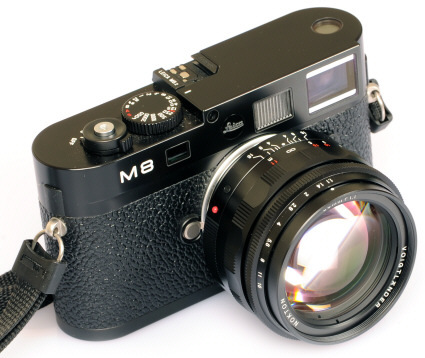 Use the 35mm finder for the M3. For the Epson RD1 use the Epson's 35mm frameline. For the Voigtlander Bessa R, R2, R2A, R2M, R4A, R4M manually set the 35mm frameline. 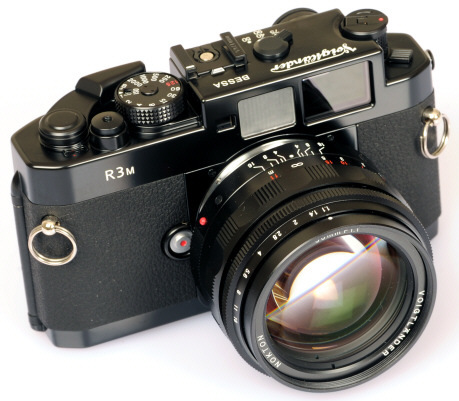 For the Voigtlander R3A, R3M try shooting the entire 40mm view. If that does not work for you, like the M3 you have a choice of the accessory 35mm viewfinder, 28/35 minifinder, or 15-35 Zoomfinder. Adapted to the various NEX, M43 and other "mirrorless" digital cameras, most shooters work with live view, but most cameras will allow you to add accessory viewfinders if you prefer them. Your choice depends upon the crop factor of the camera you are using. 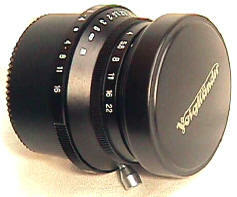 Introduced in Japan in August 1999, the Voigtlander 35/1.7 Ultron was the first Aspherical 35 ever made in LTM mount. It has a very high quality of fit and finish, in either silver anodized or black paint. It is styled very much like first version classic 50/1.4 Summilux. However this is a modern multi-coated 8 element, 6 group design with an Aspherical rear element. Some photogs consider the 35 their "normal lens." User reports generally rate this lens the equal of the pre-Aspheric 35/2 Summicron, though not quite up to the performance of Leica's much more expensive Aspherical Summicron. With my .72 M6, the lens intrudes only about 10% inside the 35 frame. One of the sharpest fast 35 lens ever made in Leica Screw mount. Discontinued April 2007, its better than any vintage fast 35mm Leica Screw Mount lens. 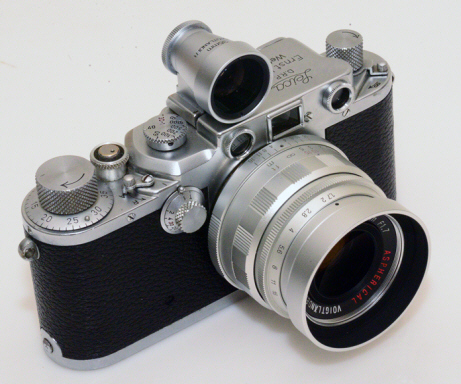 Above the silver 35/1.7 is shown mounted on a wartime Leica IIIC K with the Voigtlander 35mm viewfinder. Notice the convex front element. 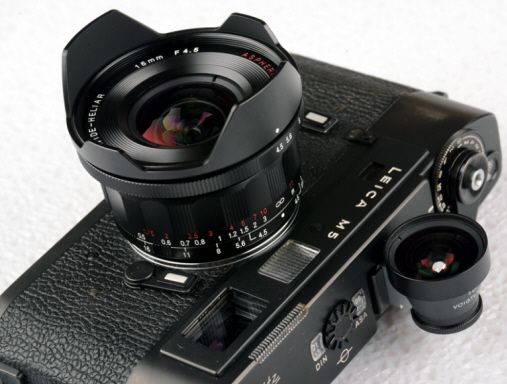 While the silver 35/1.7 has an anodized finish, the black 35/1.7 enjoys traditional black paint as shown mounted on a Leica M240. 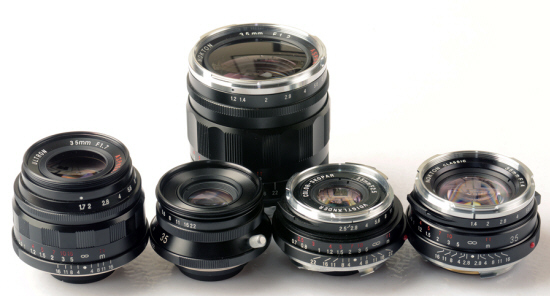 The Voigtlander family 35mm lens group shows the 35/1.2 V2 in the back, and the 35/1.7, 35/2.5C, 35/2.5P and 35/1.4 left to right. The 35/1.7 has click stops every half stop and a filter size of 39mm. The 39mm filter fits tightly inside the shade, and is not accessible for removal or mounting without 1st removing the shade. Included with the lens is the screw in lens shade and front and back caps. The metal lens cap fits snug tight over the lens shade. The rangefinder coupled close focus distance is just under 3 feet. Weight is just under 8 oz, with silver or black lenses weighing the same. Care was taken with a 10 leaf diaphragm blades, to produce maximum out of focus images -- called "Bokeh" by Japanese photogs. The rear elements do not protrude deeply into the body, making it easy to use with the M adapter on the M6, M5, CL, or CLE. 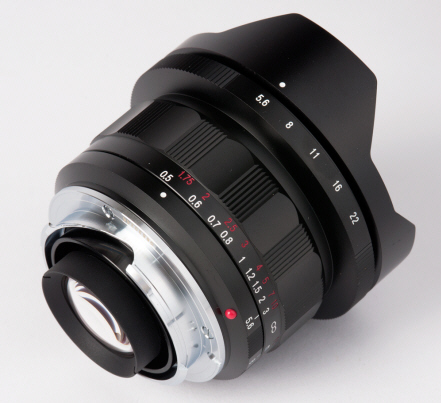 The 35/2.5 P II Leica M mount lens was introduced in Las Vegas at PMA in February 2004. The 35/2.5 C, 35/2.5 PI, 35/2.5 PII and 35/2.5 SC in Nikon Rangefinder mount all share the same optics. Using 7 elements in 5 groups, 10 aperture blades, weighs in at only 134 grams, 39mm filter size, measuring 55mm wide by 23mm long, with rangefinder coupled focusing as close as .7 meter. Physically the lens and shade are styled much like the Leica pre-aspheric 35/2 Summicron, even down to the focusing tab and aperture controls, which I find extremely easy and comfortable to use. The new snap on 39mm cap will likely prove popular for other lenses as well. This is a very popular, sharp, small 35mm lens. The bayonet on metal LH-4 vented shade is sold separately as it is not included with the lens. The LH-4 will also fit on the 50/2 Heliar (both screw mount and M versions). The shade is very well designed and made, reminding me of a Leica shade. The shade has a white dot which matched up to the small black aperture index on the lens at f/2.5. Mount the shade and the rotate it clockwise. IF the lens is at infinity, you will pick up some resistance at about the unmarked 1.1 meter focusing mark. Continue rotating the shade until the white dot locks at about the .75 meter focusing mark. Once mounted, the shade leads to a bit of confusion as the hood's white dot index is much easier to see than then fine black index mark of the aperture ring. Translation: if you are not watching what you are doing, you may try to set the aperture by the hood's white dot. I cured the problem on my 35/2.5 II by painting over the white dot with drop of red paint, and by adding another white dot on the lens hood, opposite the black aperture index mark. 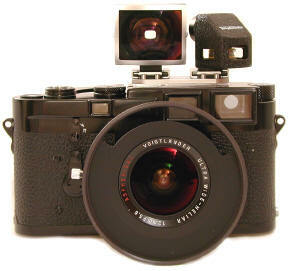 Leica Screw Mount DISCONTINUED - - add Screw Mount adapter for perfect compatibility Leica M cameras! For ANY Leica Screw Mount or Leica M mount camera! 8/08 The silver 35/2.5 C is discontinued and sold out at the factory. 7/09 black 35/2.5 C is discontinued and sold out at the factory. The 35/2.5 C is a delightful lens, very small, and with a quick focusing lever like the 25/4, because it is built on the 25/4 lens barrel ! Personally, I prefer the 35/2.5 C version over the 35/2.5 P "pancake" because of the smaller size and the built in focusing lever. 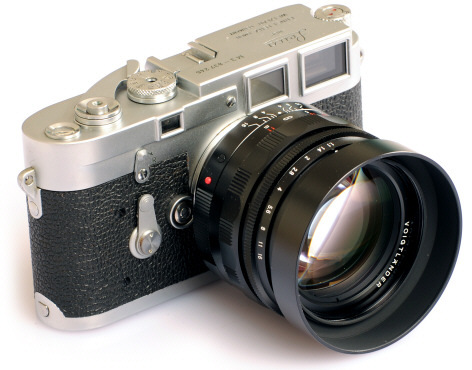 Unlike the 25/4, this lens is rangefinder coupled, but without click stopped focus points. Optics between the "Pancake" and "Compact" 35/2.5's screw mount lenses are the same, 7 elements in 5 groups. 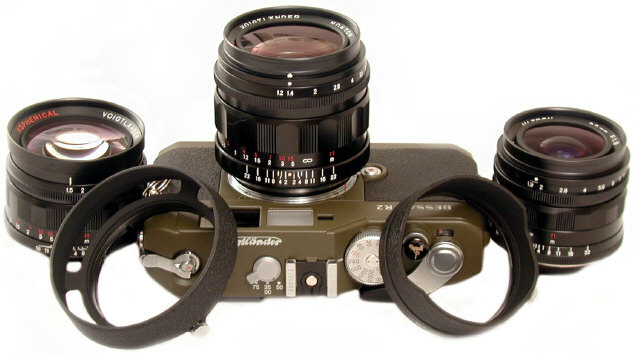 The same optics are found in the M mount 35/2.5 P and the Nikon Rangefinder mount 35/2.5 SC. The 35/2.5 Compact focuses very close to just under 2.5 feet and weighs only 4 1/2 oz. -- roughly half the size and weight of the 35/1.7 Ultron. Unlike the 35/2.5 Pancake version, a sunshade is included with each lens. 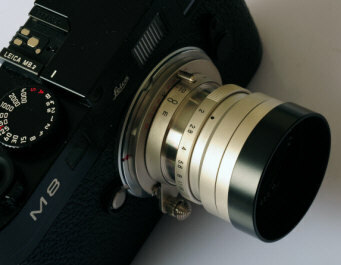 Note the Leica styled "35" on the lens barrel, to help prevent confusion with the identical sized 25/4. It has a field of view of 63 degrees, and 10 aperture blades. To mount a filter, remove the shade, mount the 39mm filter, and then remount the shade. The filter fits tightly inside the shade, and is not accessible for removal or mounting without 1st removing the shade. The 35/2.5 C is slightly smaller and lighter than the 35/2.5 P, and uses 39mm filters instead of 43 mm filters. 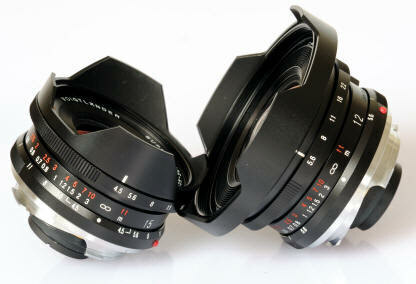 The 39mm filter size is important since it also fits the 21/4, 25/4, 35/1.7, 90/3.5, and numerous Leica lenses. The 35/2.5 C shares the optional LH-2 Square hood with the 50/2.5. The 35/2.5 C is shown between two shots of the 35/2.5P for comparison. 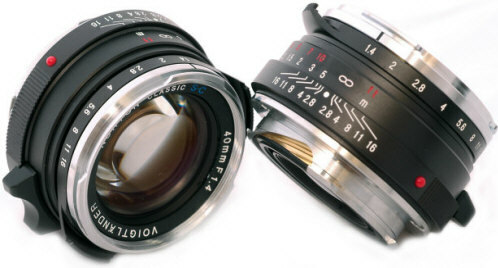 This hard to find lens is unique in the Voigtlander lineup as it has an exceptionally short focus throw. 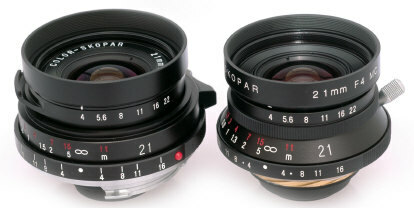 Introduced in January 2000 with the Voigtlander Bessa R, a "Pancake" 35/2.5 Color Skopar P, and a "Compact" 35/2.5 Color Skopar C. Both are identical optically, with 7 elements in 5 groups and 10 aperture blades. The big plus point for this lens is the extremely short throw from infinity to close-up. IF you want to follow action or a moving subject with your rangefinder, the 35/2.5 P may be the fastest focusing 35 you will find. 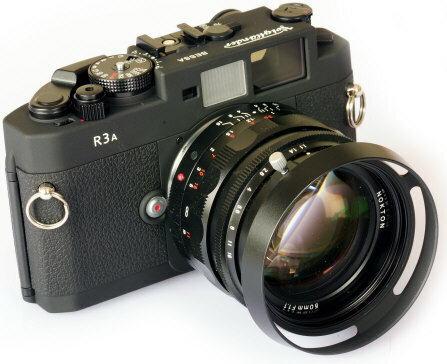 The 35/2.5 P Type I was discontinued April 2003, replaced by the 35/2.5 P Type II in Leica M mount April 2004. The SAME glass is in the 35/2.5C Screw mount, 35/2.5P Leica M Mount, and the 35/2.5 SC for Nikon Rangefinders. I think the "Pancake" rangefinder coupled 35/2.5 P is misnamed. I was expecting a much flatter lens to justify the "pancake" name. The size is about the same as the last version of the pre-aspherical 35/2 Summicron -- small but not super flat like other "pancake" lenses of the past. The filter size is 43mm, the weight about 5 oz, with a close focus to .9 meters. This is a small lens, but still larger than I had expected considering the term "pancake." Perhaps Japanese pancakes are thicker than American pancakes. 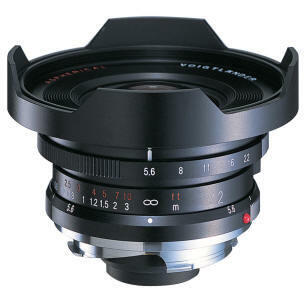 Strangely the lens shade is sold separately -- unlike any of the other Voigtlander Leica screw mount lenses. What is unusual about this lens is the VERY short throw from close-up to infinity. In this regard, it is faster to focus than its 35/2.5 C brother. The 35/2.5 P screw mount is roughly half the size of the similarly styled 35/1.7, but still overall larger than the 35/2.5 C. To mount a filter, remove the shade, mount the 43mm filter, and then remount the shade. The filter fits tightly inside the shade, and is not accessible for removal or mounting without 1st removing the shade. The 75/2.5 shares the 43mm filter size. SPEED KING! 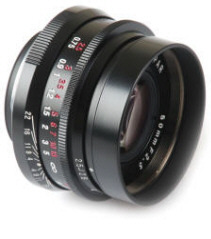 FASTEST 40mm EVER made for any full frame 35mm Camera! 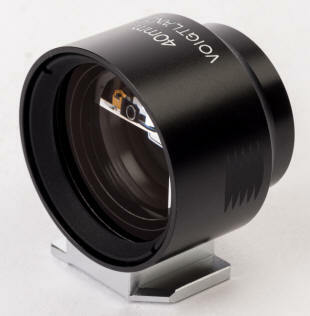 This fast small sharp lens is extremely popular! 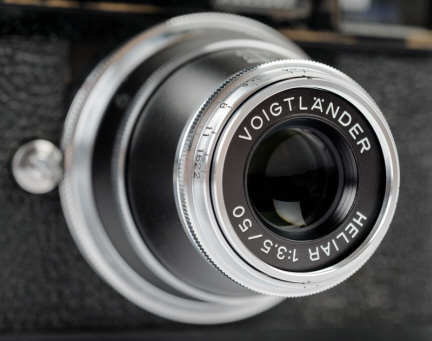 Announced 9/20/2004 at Photokina 2004, the 40/1.4 is the most popular Voigtlander fast lens! The 40/1.4 is designed for the classic 1970's look that is highly prized by many Japanese photographers. 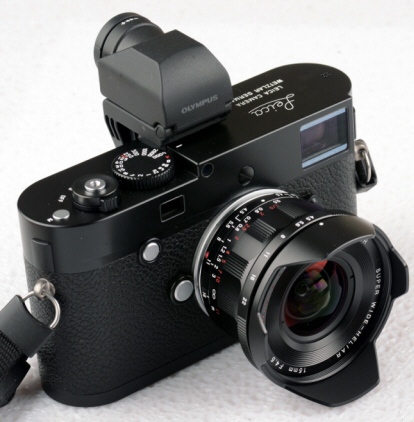 this is currently the smallest, lightest, and least expensive new Leica M mount 40mm lens available! If I am not mistaken, the Voigtlander 40/1.4 was the fastest 40mm lens ever made for full frame 35mm photography, by ANY camera manufacturer, UNTIL Voigtlander introduced the even faster 40/1.2! 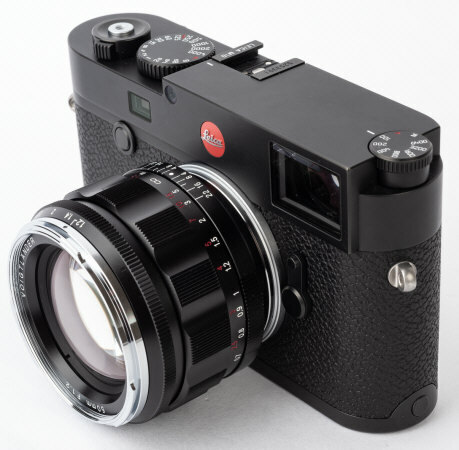 Available initially only in black Leica M mount, it is rangefinder coupled, 43mm filter size, 7 elements in 6 groups, with a close focus of .7 meter. Dimensions are 55mm wide x 29.7mm long with a weight of 175 grams. Some photogs especially prize the 40mm focal length a providing the best and most natural perspective for 35mm 24x36 format, including noted American photography writer Mike Johnston. Like the 35/2.5 Pancake II, no lens hood is included with the 40/1.4. 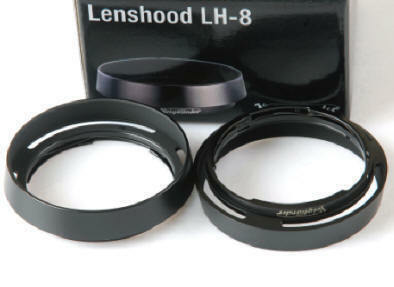 The vented LH-6 lens hood is sold separately at $69. Cosina introduced TWO versions of the 40/1.4 at Photokina 2004. 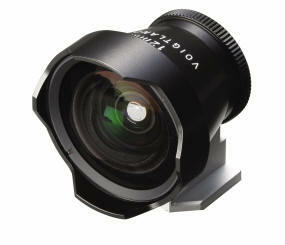 The standard production version is the multi-coated Nokton Classic. The limited production version for the Japanese home market is the 40/1.4 S.C. This is where it gets confusing. Cosina already makes multi-coated SC lenses (no periods) in classic Nikon Rangefinder mount. The 40/1.4 S.C. stands for "Single Coated". Why you ask? Because there is more to photographic imagery than super sharpness and the best possible lens test results. Some Japanese photogs prefer the imagery of single coated lenses to multi-coated lenses, and so this limited edition version of 500 40/1.4 S.C. lenses. The first production run of the single coated 40/1.4 was a quick sell out in the Japanese home market. The 2nd production 40/1.4 SC lenses arrived 3/31/2005. 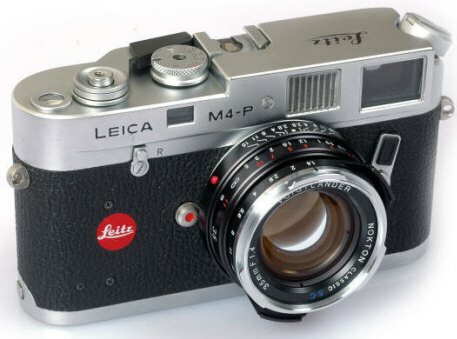 The 40/1.4 is a particularly good match for the Leica M3, as the M3's entire viewing area outside its 50mm frameline approximates the 40mm field of view. 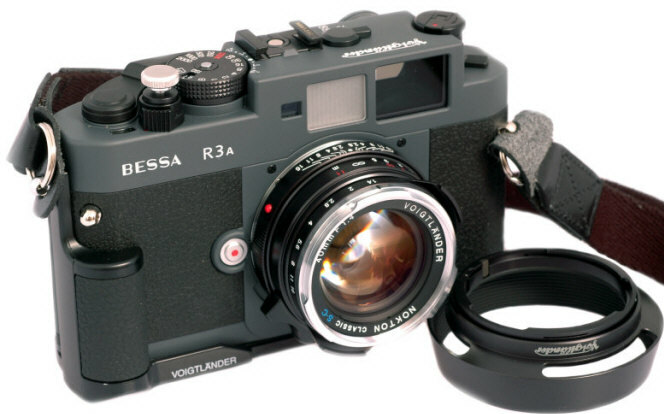 Mr. K intends the 40/1.4 for his own Bessa R3A and R3M with their superb 1:1 life size finder and 40mm brightline. 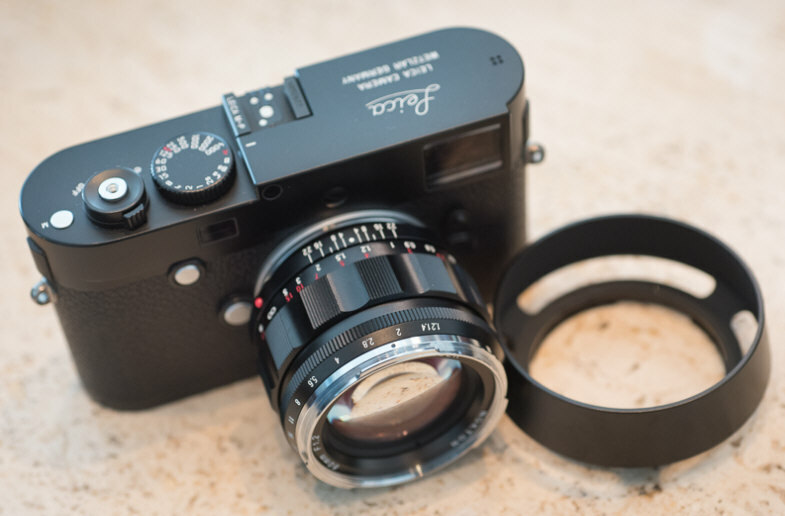 The 40/1.4 brings up the 50/75 frameline on Leica M series cameras (film or digital), just like the previous Leica 40/2 lenses for the Leica CL and Minolta CLE. So you will need to imagine about 20% outside of the 50 frameline to approximate the 40/1.4's field of view. For cameras with manually set brightlines without a 40 frameline like the Bessa R2, R2A, R2M, R4A, R4M and Epson RD1, some people prefer instead to choose the 35mm frameline and shoot inside of that for the 40/1.4. 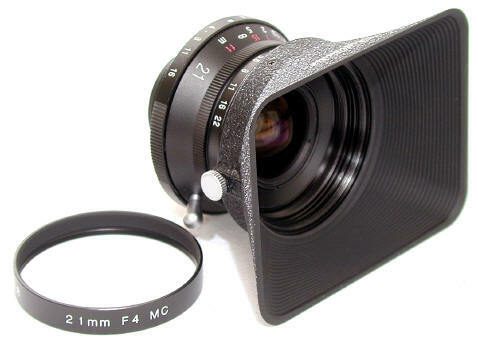 Mounted on a Leica CL, Minolta CL or Minolta CLE, the 40/1.4 will bring up the 40mm frameline. Super FAST Knock Your Socks Off Nokton! IN STOCK! READY TO SHIP! Tom Abrahamsson's take on the new 50/1.1! 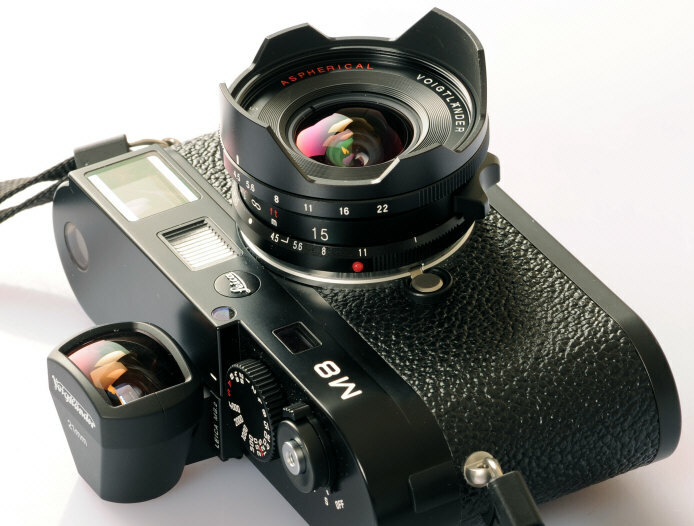 "The Nokton 50 1.1 is a better lens than the 50/1 Noctilux"
This is the first time a M mount lens faster than f/1.2 has EVER been produced by anyone except Leica! 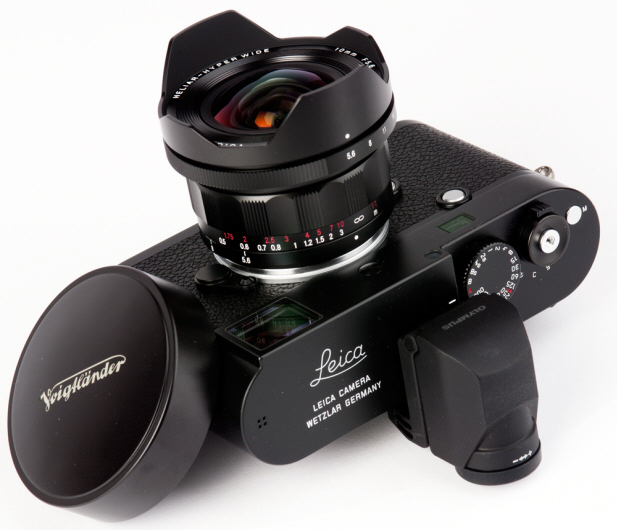 It's price is about 1/10 the price of a new Leica 50/.95 Noctilux! 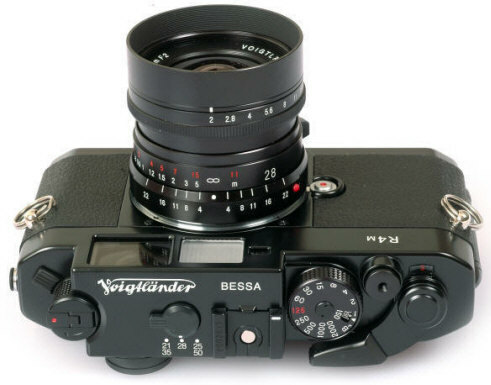 for the 10th Anniversary of his 1999 Voigtlander Bessa system as well as for the 50th Anniversary of Cosina! 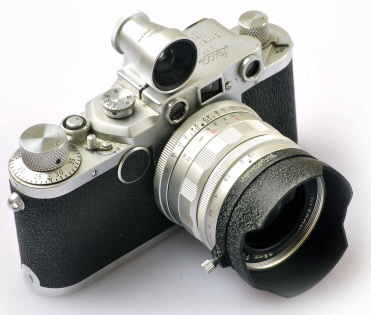 The 50/1.1 is a good match for all Leica M mount cameras EXCEPT for cameras with a shorter rangefinder base such as the Leica / Minolta CL, Minolta CLE, and Voigtlander Bessa R4A / R4M -- unless you don't open the lens wider than f/2 shooting in the 3 to 8 foot range. 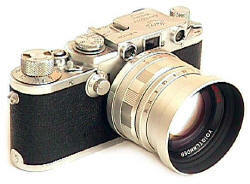 Short rangefinder base length cameras can't focus 50mm lenses accurately and consistently IF opened up wider than f/2. However you will usually be happy with the focus wide open at 1.1 on the same camera if your subject is 20 feet or further away. First Pic: Knock Knock: 50/1.1 Nokton and 35/1.2 Nokton 2nd Pic: Current production Matt Black Bessa R3A with 50/1.1 Nokton, LH-7 Vented Hood and Standard Round Hood. 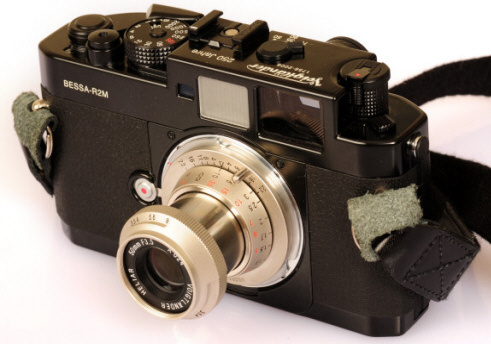 The LH-7 is best for Leica M bodies as it can block the RF patch on Voigtlander Bessa bodies. LH-7 Instructions: To attach the LH-7, first remove the standard hood. Then mount the screw on the LH-7 to the lens (or to a 58mm filter mounted on the lens). Loosen the LH-7 locking screw and rotate the LH-7 hood for maximum visibility thru the viewfinder with that particular camera body. Then tighten down the LH-7 set screw. 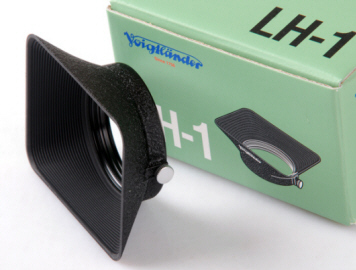 The LH-7 can be stored in reversed position on the 50/1.1 by loosening the set screw and leaving the retaining ring on the lens. The clip on lens cap can be used with either lens hood attached, as well as with the LH-7 reversed. Tom Abrahamsson's take on the 50/1.1 Nokton! "The Nokton 50 1.1 is a better lens than the 50/1 Noctilux"
Indeed, there is a 50mm f1.1 from Cosina. I did shoot with it in March when we were in Japan. Of course, I had to keep quiet about it, which is not easy! 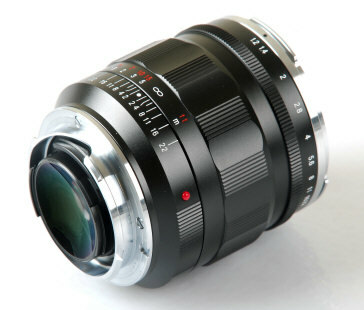 It is a very sweet lens, slightly smaller than an older style Noctilux, 58mm filter thread. Weight seemed to be similar, or slightly lighter. The prototype looked a bit like a Nokton 50f1.5 on steroids. Similar knurling on the focus and it "sat" well in the hand when on the camera. There were two versions of the hood. One was a smallish, thread mount one, slightly flared (minimum intrusion into the finder of the M2 and ZM) and the other one was a larger diameter one with a clamp-on screw. Image quality was very good. For obvious reasons I shot most everything at f1.1 or there-abouts. The corner fall off is less than on the Noctilux f1.0- looks to be around 1,0-1.5 stops. Less of peering through a tunnel as the Noctilux tended to create. Sharpness at f1.1 is very good - I did not do "resolution" tests - but looking at the negatives - I would have no problem blowing them up to 11x14 or 16x20 without having the lens being the limiting factor. I did shoot most of the pictures with Acros 100 and developed them in Beutler. This is a combination that takes "no prisoners" in terms of sharpness and contrast. What I liked is the fact that a/ a bit more compact than the Noctilux and b/ apart from being very good at f1.1 - the quality when stopped down held up and it is nice and sharp throughout the whole f-stop range. This means to me that it could do duty as a "standard" 50mm without loosing image quality in bright light and on the "dark" side. When you are looking at superfast lenses, you are in another field. ANY aberration in the optical field is magnified (see Noctilux!). If you want no distorsion, no vignetting etc - get a Heliar 50f3.5 and a tripod. The lens I was using was a prototype (I think it was #2, but there was no markings on it). And it was a f1.1 - thats what I shot it at! Why have it if it is not used at that speed. I like it for several reasons. 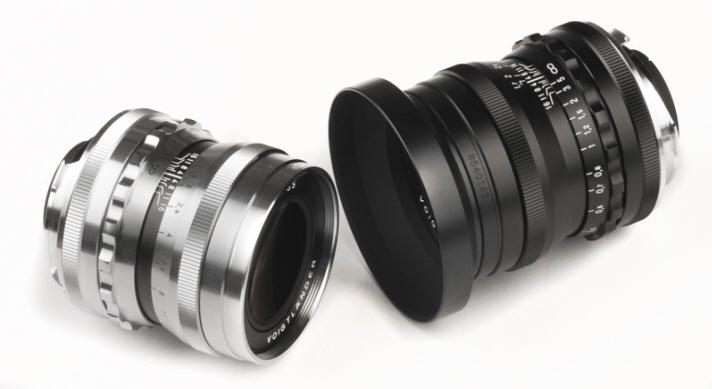 A/It is affordable, B/ it is a modern lens with 35 years of evolution since the Noctilux when it come to glass composition and coatings, C/ It is compact enough that it can substitute for a regular 50 with the added speed when needed. I have had 6 50/1 Noctiluxes over the decades, they can do good work, but they are afflicted with various problems, massive edge fall off, very low contrast at f1, not particularly good at medium f-stops. All of this should be put into context of Dr Mandler designing it close to 40 years ago. 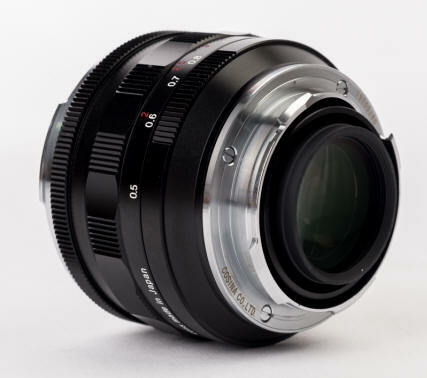 The Nokton 50 1.1 is a better lens than the 50/1 Noctilux and so is the Hexanon 50/60f1.2 - as they should be with the technology advances over the decades. If you like what the Noctilux does, by all means get one or keep yours, but I would prefer a modern lens. So, it is "cheap" compared to the Noctilux - a decade ago you could pick up Nocti's for sub $1000 because nobody wanted them. Hype pushed the price initially and the stratospheric raise with the 50f0.95 also did it. I have seen very little stuff done with that lens so I have no opinions about it - but I certainly hope it will be better in some aspects than the Nokton f1.1 - probably not enough for me to consider it though. 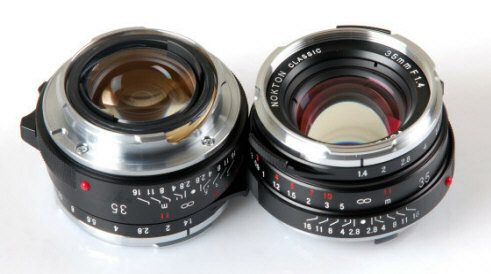 I rather have $8800 in my pocket and the Nokton!!!!!! I just put up 18 shots done with the Nokton 50mm f1.1 on our Flickr site. 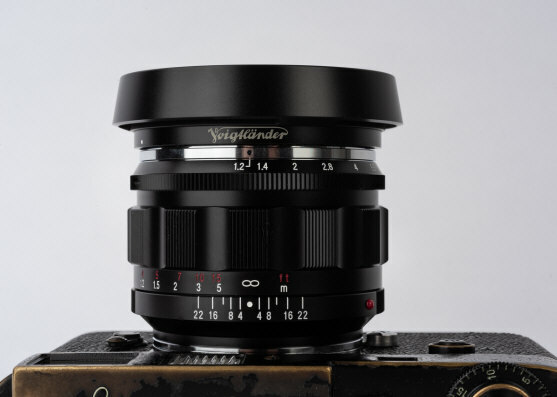 Use the tag "Voigtlander Nokton 50mm f1.1" and they should show up. These are large enough files that if you take them up to "original" size you can see details. I tried to pick somewhat representative images (f1.1, close (1m) and stopped down a bit etc). Sharpness at f1.1 is quite remarkable - very low flare, very little if any distorsion and, yes , it is a damned good lens and at a price that is palatable too. If you go to http://www.flickr.com/photos/rapidwinder/sets/72157616278125070/ there should be 18-19 shots from the 50/1.1. 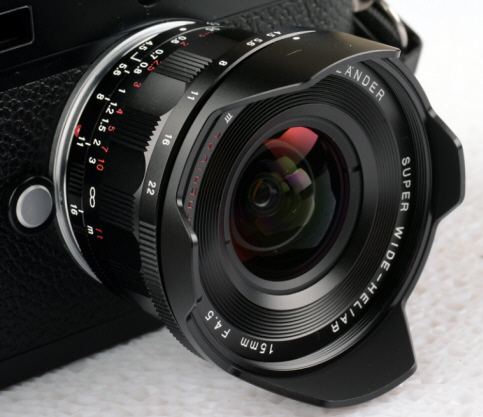 modern sharp multi coated ASPH lens with the look and sharpness of the very popular Voigtlander 40mm f/1.2 ! The 50/1.5 Aspherical is famous for outstanding sharpness and beautiful bokeh. Voigtlander had the reputation of building what some considered the best performing Super Speed lens of its time, the Voigtlander 50/1.5 Nokton. 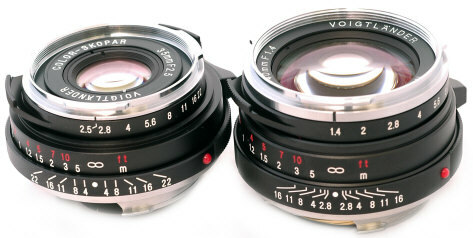 The large majority were produced in Voigtlander Prominent Mount, but a few were also made in Leica Screw and Zeiss Contax Mount. Below you will find my 1998 write up on the classic Leica mount version. 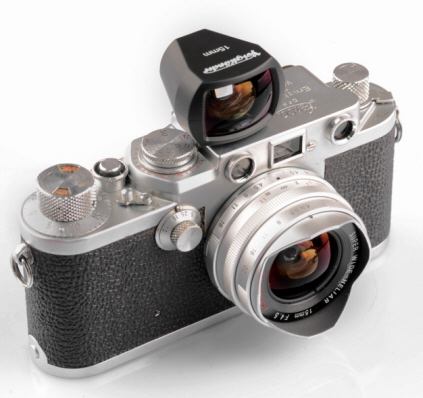 Mr. Kobayashi used the classic 1950's Leica mount version as his inspiration for the new 2013 Nokton! - Discontinued but still available! 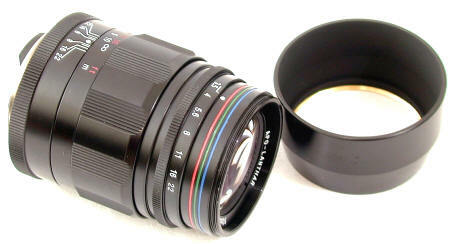 this too is a very popular lens used, as sharp screw mount 50mm f/1.5 lenses are hard to find! Above: Black Voigtlander 50/1.5 Nokton mounted on a standard M mount (via a standard screw mount to M adapter) Voigtlander Bessa T with side grip, and a Silver Voigtlander 50/1.5 Nokton with vented hood LH-3 is shown mounted on the M mount 101 Heliar Anniversary Grey Heliar Bessa T (via a standard screw mount to M adapter). 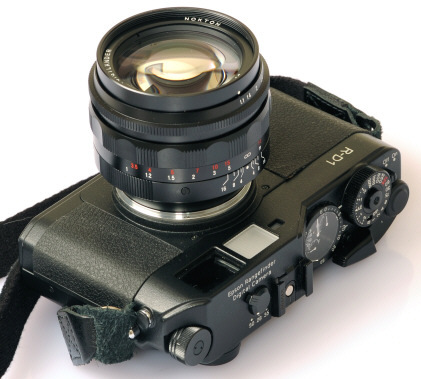 The 50/1.5 Nokton is an impressive well made rangefinder coupled lens with two aspherical rear element surfaces, introduced in Japan November 1999. Weight with lens shade 9 oz, with silver or black lenses weighing the same. All controls large and easy to work. It has half click stops and ten aperture blades. Minimum aperture is f/16. Close focus distance .9 meter or just under 3 feet. The 52mm filter fits tightly inside the shade, and is not accessible for removal or mounting without 1st removing the shade. Included with the lens is the screw in lens shade and front and back caps. The lens cap fits over the shade. 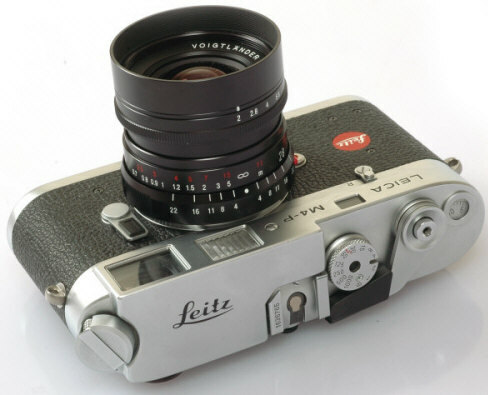 It has classic '50's styling similar to the original chrome Leitz 50/1.4 Summilux of 1959. Considering the price of the new price of a new 50/1.4 ASPH Summilux, this lens is quite a bargain! 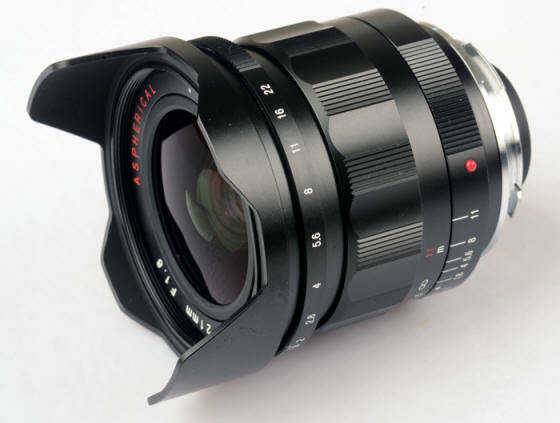 User reports generally rate this lens the equal or better than the older non ASPH 50/1.4 Summilux, a 40 year old design. It came as a bit of a surprise to learn the LH-3 vented hood designed for the 35/1.2 will also fit the 50/1.5. Just remove the standard hood and then clamp the LH-3 into place. It is not a perfect fit, but it does indeed work! Today, even though discontinued, the 50/1.5 Nokton is sought after for its overall combination of sharpness, bokeh, and overall image quality. For the Leica M8/8.2/9 use the Leica's 50mm frameline which is bought up automatically with the traditional 50/75 screw mount to M adapter. For the Epson RD1 use the Epson's 50mm frameline. The M mount 50/2 Collapsible Heliar was produced exclusively for the 2006 Voigtlander Bessa R2M and R3M 250th Voigtlander Anniversary sets INFO HERE. 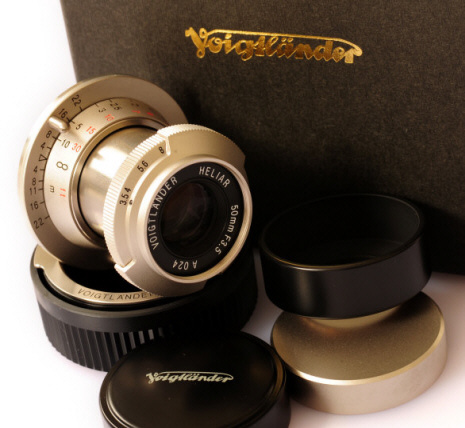 Only 800 were produced in chrome, 1700 in black paint as part of the for the Voigtlander 250th Anniversary R2M or R3M sets. They are beautifully crafted lens, down to the bayonet on lens hood and red mounting dot. 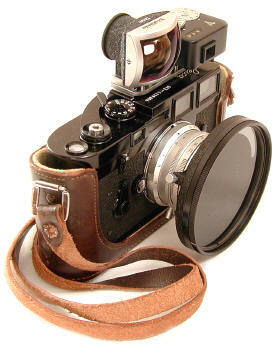 The standard lens hood is a small tubular hood, although the LH-4 produced for the 35/2.5 PII also mounts perfectly. 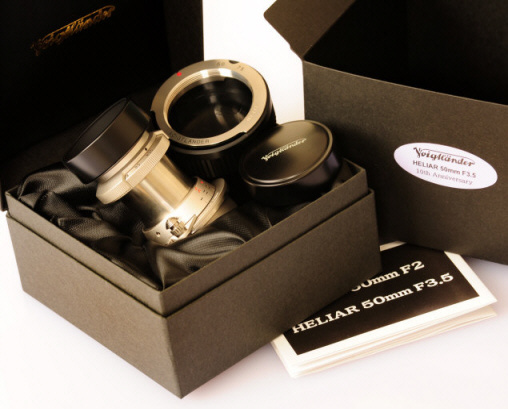 I believe this to be the fastest Heliar lens design ever produced by any lens manufacturer. 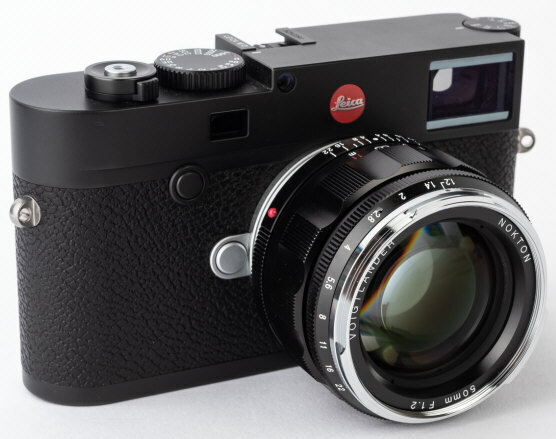 Leica's current 50 collapsible is the 50/2.8 Elmar. 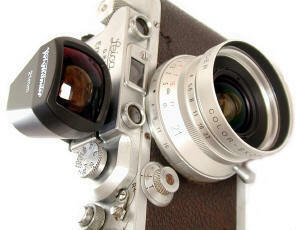 Filter size 39mm, close focus 1 meter. 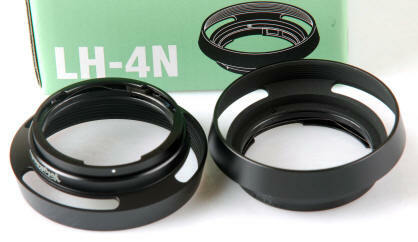 Both the standard lens hood and the optional vented LH-4 or LH-4N lens hood have bayonet mounts. To remove the standard hood, push in towards the camera and rotate off. This is one of the few CV lenses whose silver version is chrome, not silver anodized. 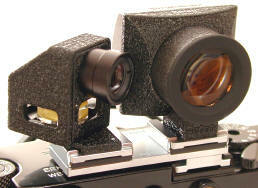 In 2009 the same optics were used for the limited edition Rigid Nickel Leica Screw Mount 50/2 Heliars. COLLAPSIBLE NOTE for Leica M8/8.2, M5, CL, Minolta CLE, Konica RF: On my five sample cameras, the Voigtlander 50/2 Heliar collapsed safely into the Leica M8/8.2, M5, CL, Minolta CLE and Konica RF! Note that there are most likely unknown production variations in both the lenses and cameras. so proceed with caution before you inadvertently jam or damage your camera. For the Leica M8/8.2 use the M8's 50mm frameline, bought up automatically with the traditional 50/75 screw mount to M adapter. For the Epson RD1 use the Epson's 50mm frameline. To my eyes, the Nickel 50/2 Voigtlander Heliar is the prettiest lens made so far in the Cosina-Voigtlander collaboration. To me the beauty is its classic styling combined with the very pretty Nickel finish. Long term, I think the Nickel 50/2 Heliars will be sought by shooters and collectors alike! Special Serial Number: 600 each of the nickel Heliar 50/3.5 and 50/2 were produced. The serial numbers are divided up into 6 groups starting with H, E, L, I, A or R. Numbers ranges from 001 to 100. The lens above is H024. Side by Side, Nickel 50/2 Rigid Screw Mount Heliar and Collapsible Black 50/2 M Mount Heliar - SAME optics in both! Very compact 50/2.5, 7 elements in 6 groups, 39mm filter size, f/2.5 to 22, silver or black, very convenient large quick focusing lever, heavy duty construction, the optional square LH-2 metal shade will also fit the 35/2.5 C lens. It is very unusual for a modern lens of this speed and focal length to have 7 elements -- instead of the standard six elements. 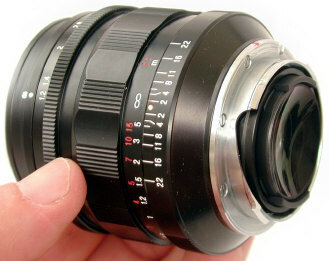 Cosina used the extra lens element to achieve an unusually compact lens size. 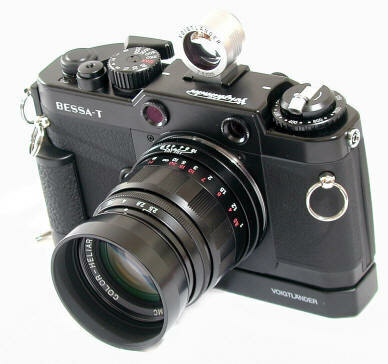 Introduced with the Bessa R2 in February 2002. 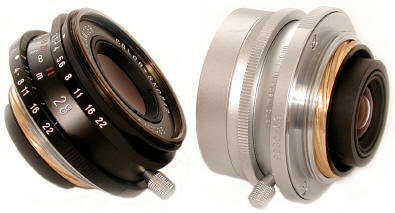 This is one of the few CV lenses whose silver version is chrome, not silver anodized. For the Leica M8/8.2 use the M8's 50mm frameline, bought up automatically with the traditional 50/75 screw mount to M adapter. For the Epson RD1 use the Epson's 50mm frameline. Left to Right: 50/2.5 w/ Square Shade, 50/3.5 Heliar, 50/2.5 w/ Round Shade, and 50/1.5 The very compact 50/2.5 shares the optional LH-2 Square hood with the 35/2.5 C.
Announced 8/28/09 This is a new version of the 50/3.5 Heliar sold with the Voigtlander 101st Heliar Anniversary Sets of 2001. This is a new collapsible Leica screw mount lens version in NICKEL finish, sold with the screw mount adapter for Cosina's 50th Anniversary and the new Bessa's 10th Anniversary. Limited production of ONLY 600 units worldwide! I believe these are the first NICKEL finish Leica screw mount lenses produced since Leica's original screw mount lenses of the 1930's! The 10th Anniversary of the Cosina Voigtlander collaboration happily coincides with the 50th Anniversary of Cosina. 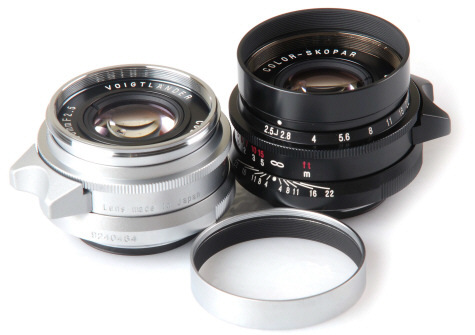 To commemorate both events, Cosina's CEO Mr. Kobayashi issued two special vintage style nickel Voigtlander Leica screw mount lenses, the 50mm f/3.5 Heliar and the 50mm f/2 Heliar. Only 600 of each of the nickel 50/3.5's and 50/2's were produced worldwide -- each issued in presentation boxes with a screw mount adapter. 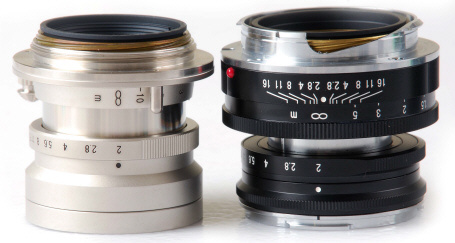 These are the first nickel Leica screw mount 50mm lenses since the 1930's! Each nickel Heliar has its own unique serial number. NEWBIES: Collapsible lenses are pulled outward from the camera body, then turned towards the viewfinder eyepiece to lock the lens into shooting position. Fail to do this and you will get very out of focus images. When not shooting, you can collapse the lens into the camera body to 1st unlocking it by turning it in the opposite direction, and then pushing the lens barrel into the camera body. A Limited Edition Legend: Towards the end of 2001, Cosina Voigtlander introduced the Bessa T 101 Anniversary set with 50/3.5 Heliar, commemorating the 101st Anniversary of the classic Voigtlander Heliar Lens Design. Yes indeed, it looks like it belongs to the classic Rangefinder days. It will sold ONLY in the new 101st Anniversary sets. 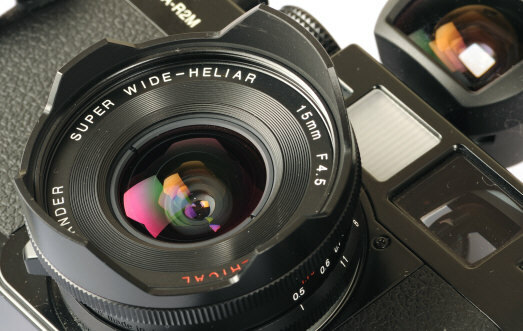 Cosina believes they have succeeded in putting the famous Heliar lens look into a 35mm format lens for the first time ever, quite an accomplishment. Indeed, many shooters report being very happy with the results and a certain hard to define "look." 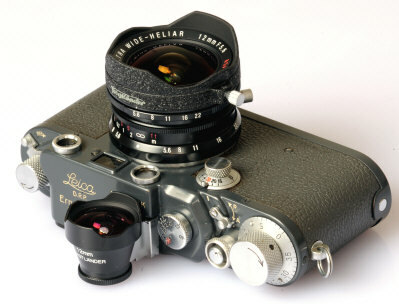 The 50/3.5 Heliar is styled similar to Leica's 50/3.5 Elmar of the 1950's, though with a much improved aperture control. Besides the classic collapsing lens barrel, the 50/3.5 Heliar has a Elmar style infinity lock with push button release, and a wonderful chrome finish. Filter size is a not so easy to find 27mm. 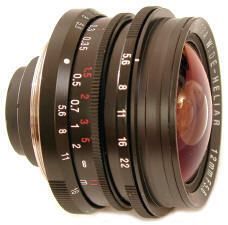 Read the highlights of Popular Photography's lens test on the Heliar 101st Anniversary Set page. 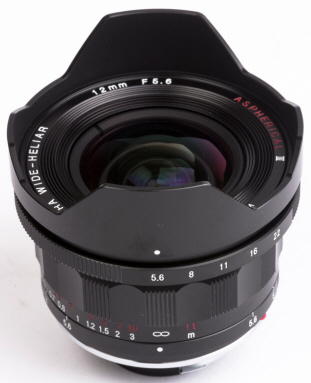 Popular considers the 50/3.5 Heliar one of the best lenses they have ever tested! 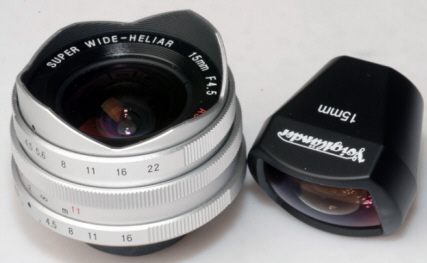 The 50/3.5 Heliar was sold only with the Heliar 101 sets, and discontinued after 500 sets were produced in each of the four color by March 2002. 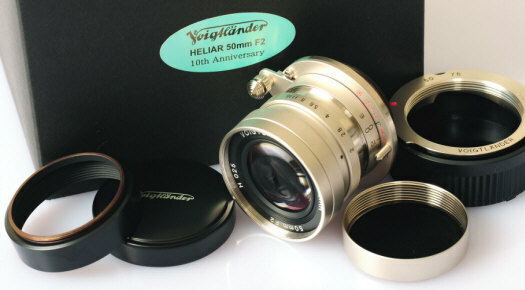 Today the Voigtlander 50/3.5 Heliar is highly sought after by shooter and collector alike. This is one of the few CV lenses whose silver version is chrome, not silver anodized. COLLAPSIBLE NOTE for Leica M8, M5, CL: On my three sample cameras, the Voigtlander 50/3.5 Heliar Leica mount lens collapsed safely into the Leica CL and M8, but not the M5! Note that there are most likely unknown production variations in both the lenses and cameras. so proceed with caution before you inadvertently jam or damage your camera. 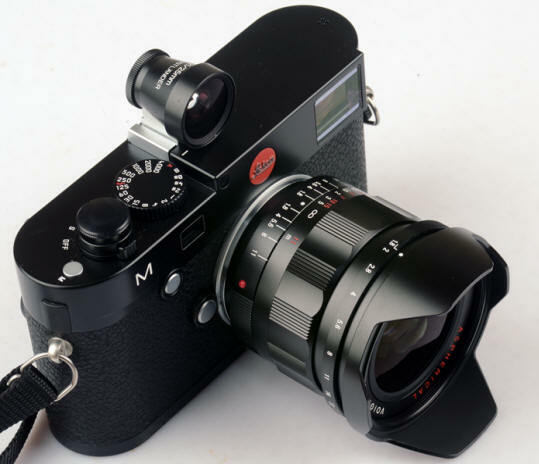 For the Leica M8 use the M8's 50mm frameline, bought up automatically with the traditional 50/75 screw mount to M adapter. For the Epson RD1 use the Epson's 50mm frameline. 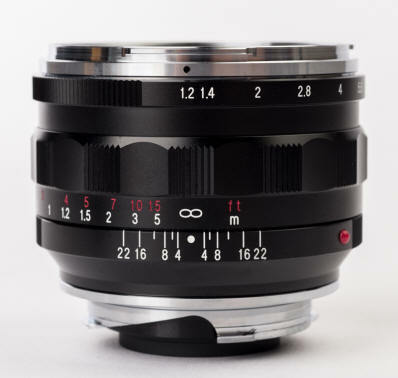 Personally I consider the Voigtlander 75/1.8 easily the BEST full frame Leica M mount lens currently being manufactured. WHY? Because the only other currently being manufactured alternatives are the sharp wide open Leica 75/2, 75/2.5, and 90/2. SUPER SHARP is not what most people find pleasing in portraits, especially if those most people are female. Granted, opinions will vary, but that is mine. The detachable clamp on lens hood is INCLUDED with the lens. It is reversible and mounts with an adapter ring between the lens and the lens hood. Black only. M mount only. Length 73.8mm, diameter 57.9mm. Weight 15 oz. Mount the lens hood retaining ring onto the lens. The lens hood clamps onto that ring. The hood is reversible for storage. Introduced in Japan in August 1999, I believe the new 75/2.5 Color Heliar is the first screw mount 75 produced since before W.W.II, and the only multicoated 75 Leica screw mount lens ever. Postwar of course, there is the 75/1.4 Summilux for Leica M. The 75/2.5 is rangefinder coupled, very well finished, and styled much like the classic 1950's Leica lenses. It's multicoated, has six elements in five groups, click stops every half stop, and a close focus of 1 meter. Care was taken with a 10 leaf diaphragm blades, to produce maximum out of focus images -- called "Bokeh" by Japanese photogs. Weight is 8 oz. Collectors: some early 75/2.5's were mis-engraved. Their closest focusing distance in feet is engraved "5.3" instead of "3.5." Again, users reports great, sharp images with the 75/2.5. The 43mm filter fits tightly inside the shade, and is not accessible for removal or mounting without 1st removing the shade. Included with the lens is the screw in lens shade and front and back caps. The lens cap fits over lens shade. 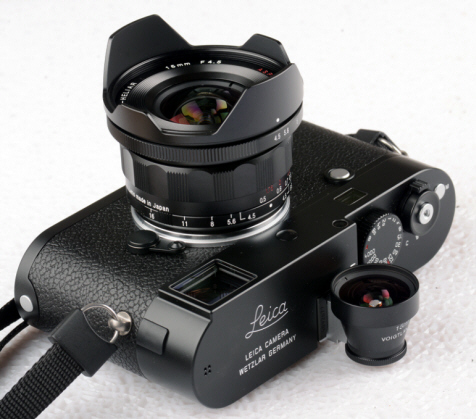 This modern multi-coated lens is probably the sharpest 75mm ever made in Leica Screw Mount. While this lens was produced in silver or black, only a few black remain - get them while you can! 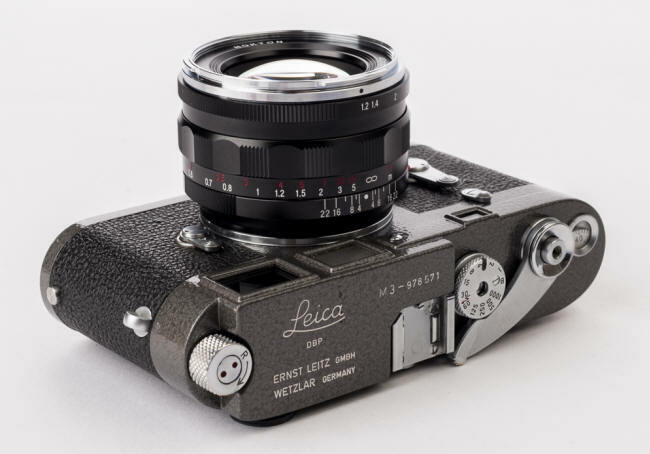 It will fit and focus accurately on any Leica M camera by adding the screw mount to M adapter! The 90/3.5 APO was introduced at the September Photokina 2000 and released February 2001 in Japan. With a 90 frameline in the Bessa R, it was not very hard to predict a Voigtlander 90 lens. 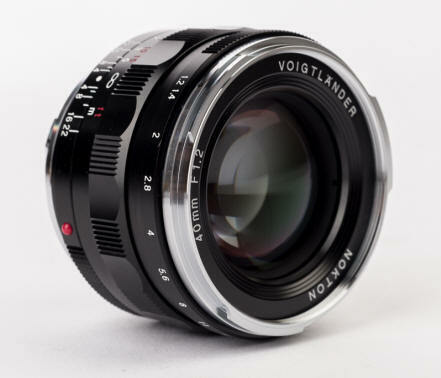 It has 6 elements, 5 groups, a close focus of 1 meter, a smallest aperture of f/22, and like the other Voigtlander screw mount lenses is available in either black or silver. The 39mm filter fits tightly inside the shade, and is not accessible for removal or mounting without 1st removing the shade. This is probably the sharpest 90mm ever made in screw mount, and among the sharpest ever in M mount. The hood is relatively large for the lens. Note the 90/3.5 lens hood does not have standard threads and will not it other lenses. The 90/3.5 APO is about the same size as the 90/2.8 Leitz Tele-Elmarit, only a few MM longer, and styled like the 75/2.5. Included is a metal hood, but the 90/4 Elmar C collapsible hood and lens cap will also fit if you want to save space in your camera bag. The new 90 brightline is very well done, is available in silver or black like the lens, and is the 1st Cosina Voigtlander finder with dial in parallax compensation. 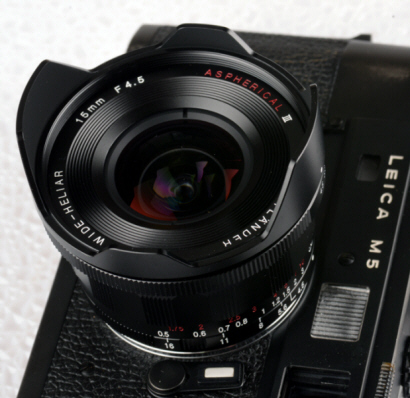 For most Leica M mount cameras - digital or film - use the 28/90 screw mount to M adapter for the 90mm frameline. For the Epson RD1 use the central 50% of a 90mm film viewfinder as an estimation, then check framing accuracy with the camera's LCD panel. Adapted to the various NEX, M43 and other "mirrorless" digital cameras, most shooters work with live view, but most cameras will allow you to add accessory viewfinders if you prefer them. Your choice depends upon the crop factor of the camera you are using. 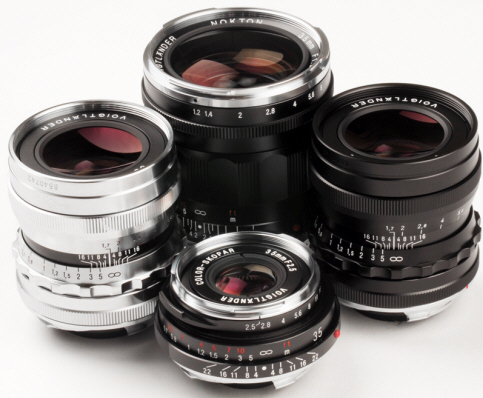 Which rangefinder outfit lenses for YOU? 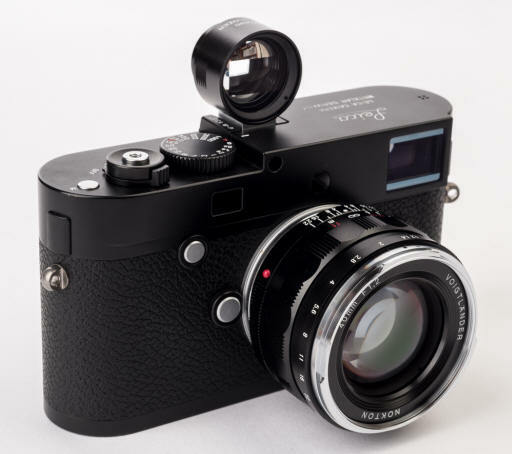 : IF you are starting your Leica rangefinder mount outfit from zero, give some thought considering which lenses will work well together, and for what purposes. IF low light is your choice, the 28/1.9 Aspherical, 28/2, 35/1.7 Aspherical, 35/1.4, 35/1.2 Aspherical, 40/1.4, 40/1.2, 50/1.5 Aspherical, 50/1.1 and 75/1.8 are Voigtlander's fastest. IF you are like portraits, the longer 75/1.8, 75/2.5 or 90/3.5 should be considered. IF you want the smallest and lightest outfit, the screw mount versions 15/4 Aspherical, 21/4, 25/4, 28/3.5, 35/2.5's, 50/2.5, and 75/2.5 should be considered. Personally for a starter two lens outfit, l like the 25/4 - 75/2.5 combination -- lightweight with a portrait and ultra wide lens is not a bad way to go. If you are starting out with one lens for awhile, most people choose their favorite of the 35/40/50 focal lengths. IF you want to keep your camera dealer deliriously happy, 15 lenses of each version in both silver and back for every room in your house is a wonderful choice ... it all depends upon what your shooting needs are. Remember that the best lens choices for your friend may not be the best choices for you. What about M43, Sony NEX, Fuji Xpro, Pentax Q, Nikon 1, and all of the other CSC Compact System Cameras? 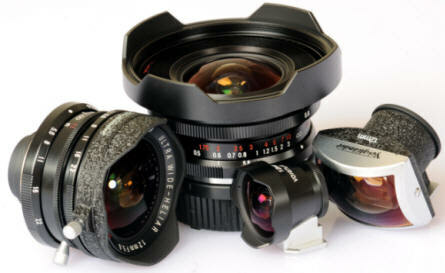 All of the lenses listed on this page can be used with the appropriate adapters. This combo is quite popular due to the smaller than SLR size of these lenses, and their often better than system camera performance. Adapted, you generally shoot using manual focusing in aperture priority mode. Add an inexpensive close up filter for close ups via live view focusing. 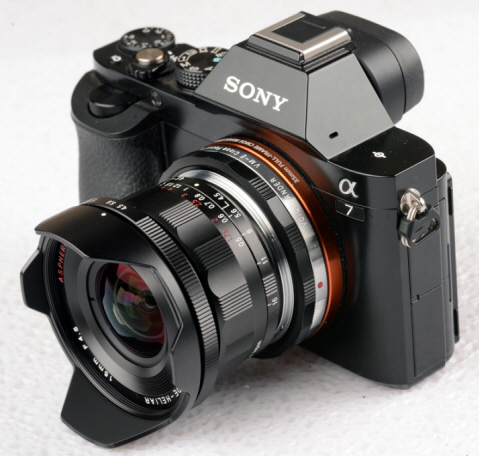 Rangefinder Lens Coupling is NOT important if you are adapting lenses to different formats like M43 or Sony NEX. 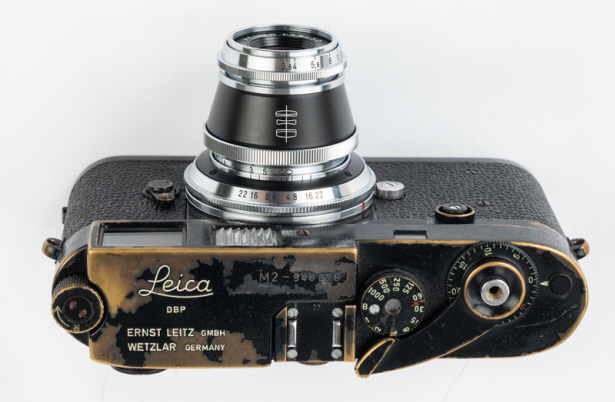 Leica Screw Mount or Leica M Mount? Many Newbies don't realize that the screw mount lenses are 100% compatible with M mount cameras via a standard Screw Mount to M Adapter. 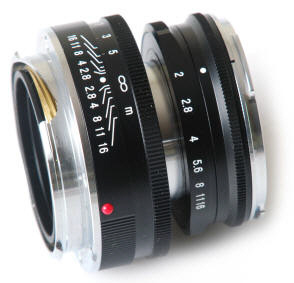 Cosina Voigtlander Leica mount lenses were produced in both screw and M mount. 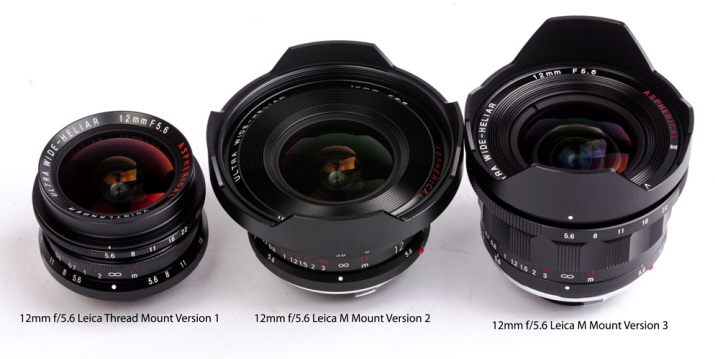 The more versatile Leica screw mount lenses (which requires a screw mount to M adapter for M mount cameras) are : 12/5.6, 15/4.5, 21/4, 25/4, 28/1.9, 28/3.5, 35/1.7, 35/2.5C, 35/2.5P1, 50/1.5, 50/2 Nickel, 50/3.5 chrome, 50/3.5 Nickel, 75/2.5, and 90/3.5. 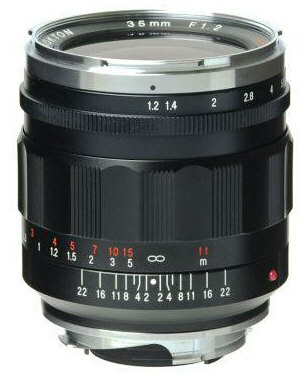 At present in 2012, only the 15/4.5 and 21/4 screw mount lenses remain in production. 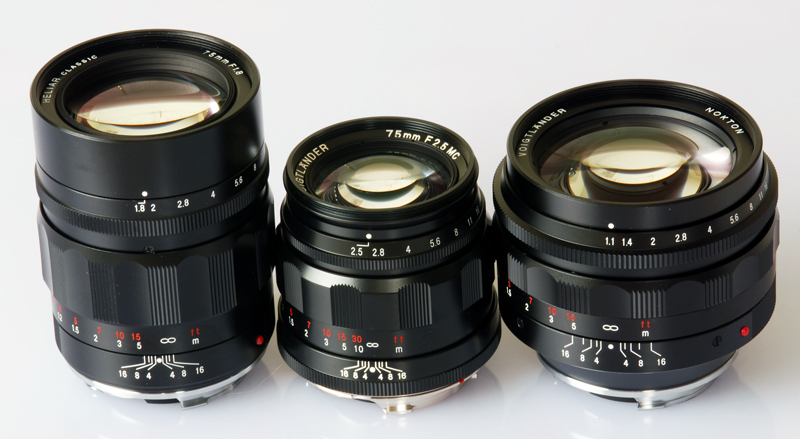 Leica M mount lenses are 10/5.6VM, 12/5.6VM, 15/4.5VM, 21/4P, 25/4P, 28/2, 35/1.2, 35/1.4, 35/1.7, 35/2.5 P II, 40/1.2, 40/1.4, 50/2 Collapsible, 50/1.5 V2, 50/1.1 and 75/1.8. 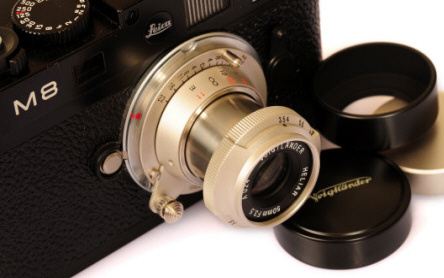 M mount lenses only fit M mount cameras, while Leica screw mount lenses can be fitted to HUNDREDS of classic screw mount rangefinders as well as M mount. 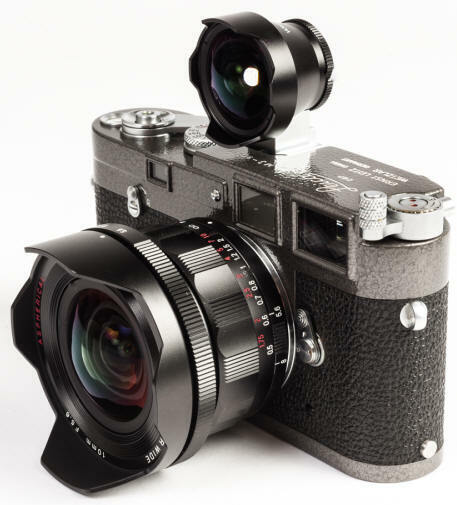 To mount Leica screw mount lenses on M mount cameras, all you do is add the very standard Leica designed 39mm screw mount to Leica M mount adapter More Info. Unfortunately the reverse is not true, i.e. 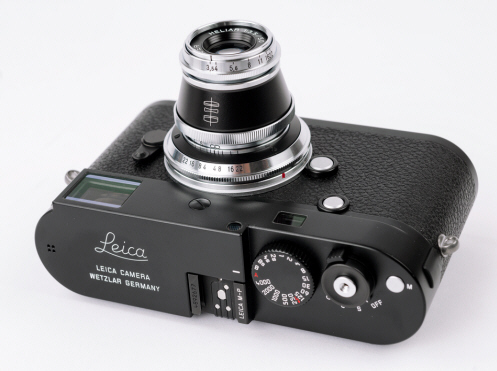 Leica M mount lenses will NOT mount on Leica screw mount cameras. 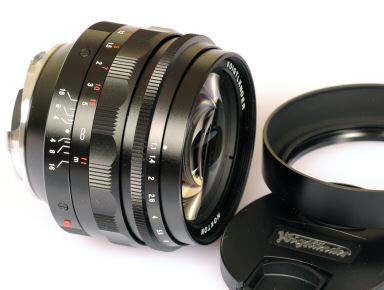 Newbies are often clueless in believing M mount lenses are somehow superior to screw mount Leica lenses. It ain't so. Screw mount lenses give you much more versatility. 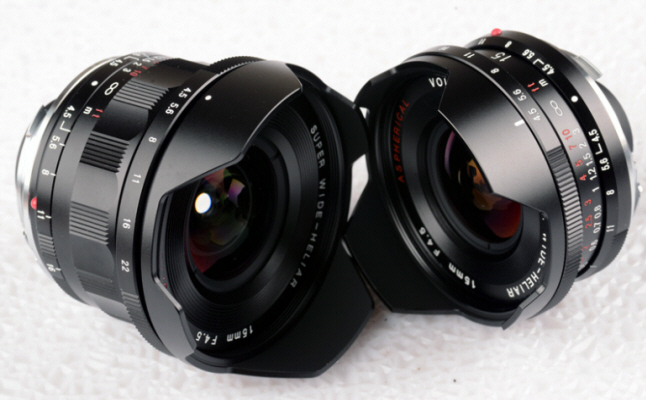 Due to greater sales success of the M mount, over time the screw mount lenses are being replaced by M mount versions. 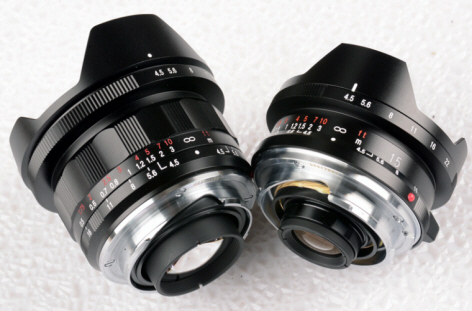 PLEASE NOTE some lenses were produced in both screw mount and M mount USING THE SAME OPTICS: 12/5.6 (LTM & V2), 15/4.5 (LTM & V2), 21/4, 25/4, 35/2.5, and 50/2. Silver or Chrome or Black or Nickel? 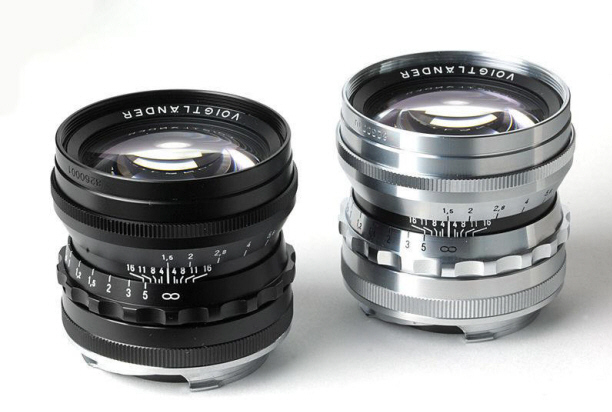 Most screw mount lenses were produced in either silver or black anodized. 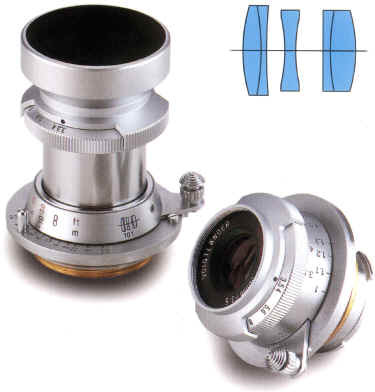 Three screw mount lenses were produced in chrome: the 28/3.5, 50/2.5 and the first 101 version of the 50/3.5 Heliar, which was also later produced in nickel The special edition 50/2 screw mount was produced in nickel only. 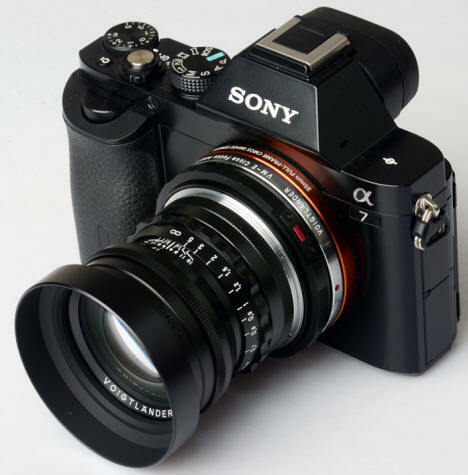 M mount lenses are generally available in black only. The 12/5.6 V2 M, 15/4.5M V2 or V3, 21/4P, 25/4P, 28/2, 35/2.5 Pancake I, 35/2.5 PII, 35/1.4, 40/1.4, 50/1.1 and 75/1.8 are available in black only. 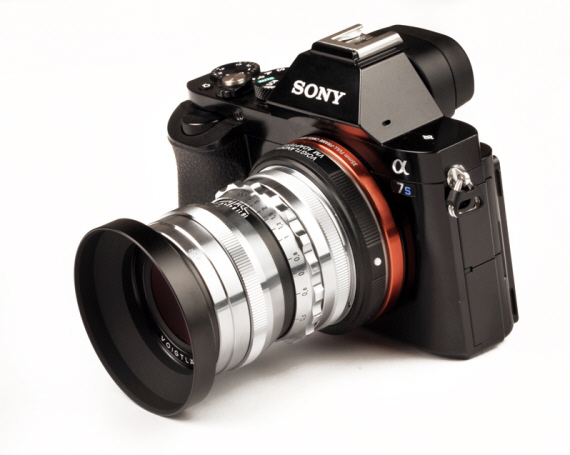 The 35/1.7 V2 and 50/1.5 V2 M mount lenses are available in black or chrome. Standard production 35/1.2's are black only, but there was a special limited edition chrome 35/1.2 of only 300 units. The 15, 21, 25, 28, 35 and 40 plastic viewfinders were produced in black only. The 12 and 15 metal viewfinders are produced in black only. The combination 21/25 was produced black in plastic, but also black or chrome in metal. The superlative metal 28 and 35 finders are available in either black or silver chrome. The 50, 75, and 90 metal viewfinders are also available in black or silver chrome. The low angle finder is available in black only. 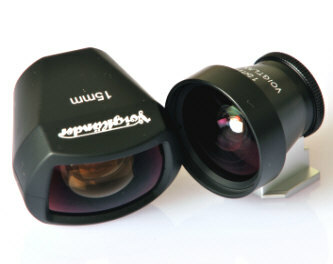 The 15-35 Zoomfinder is produced in black only. Size: The screw mount 15, 21, 25, 28/3.5, 35/2.5, 50/3.5, 50/2.5, 50/2 and 75/2.5 are noticeably smaller than the larger and faster 28/1.9, 35/1.7, 35/1.2, 50/1.5, 50/1.1 and 75/1.8. 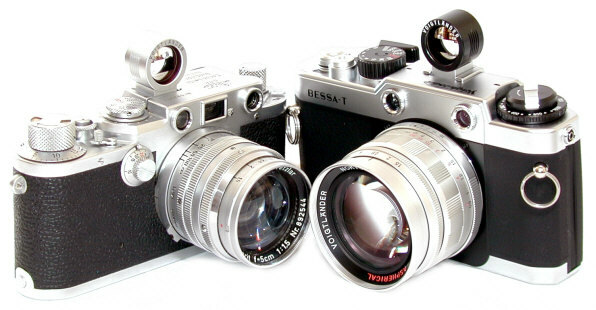 The 35/1.4 and 40/1.4 are both small and compact for their fast 1.4 aperture. The 75/2.5 is about 2/3 the size of the 90/3.5. Presently the 28/3.5 is the smallest Voigtlander lens. Focusing Levers: Some lenses have focusing levers or focusing tabs: 21/4, 25/4, 28/3.5, 28/2, 35/2.5 C, 35/2.5 P II, 50/3.5, 50/2.5, and screw mount 50/2. The 28/1.9 has an optional detachable focusing lever. Filters: IF you use filters, filter size is an issue in choosing lenses. The 21/4, 21/4P, 25/4, 25/4P, 35/2.5 C, 35/2.5 P II, 28/3.5, 35/1.7 LTM, 50/2 and 90/3.5 all use Leica's most popular filter size -- 39mm -- what an amazing coincidence ! The screw mount 15/4.5, 21/4, 25/4, and 35/2.5 C share the same lens cap, the 25/4 and 35/2.5 C the same hood. The screw mount 12/5.6, 35/1.7, 75/2.5, and 90/3.5 share the same lens cap. The screw mount 12/5.6 has a special 77mm filter attachment which replaces the hood. The 12mm V3 uses 67mm filters. The 15's LTM hood is fixed, so gelatin filters are the easiest choice, but with some tape on the barrel you can also use the LTM 12's 77mm filter adapter. The 21/1.8 uses 58mm filters. 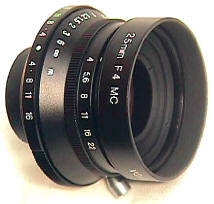 The 28/2 uses 46mm filters. The 28/1.9 and 28/2 use 46mm filters. 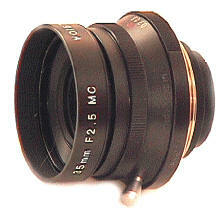 The 35/1.7 M lenses use 46mm filters. The 50/1.5 M lenses use 49mm filters. The 35/2.5 "Pancake" I, 35/1.4, 40/1.4 and 75/2.5 share 43mm filters. 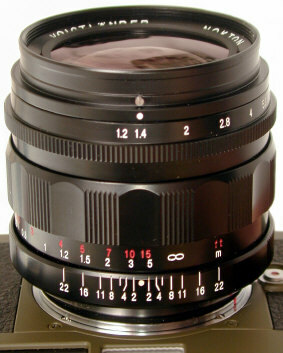 The 35/1.2, 50/1.5 LTM and 75/1.8 use 52mm filters. The 50/3.5 uses 27mm filters. 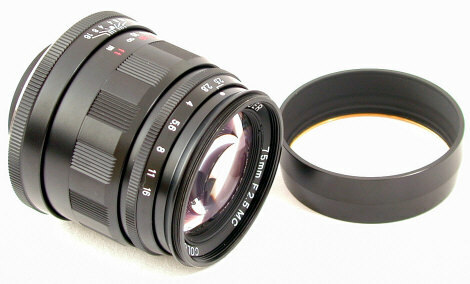 The 50/1.1 uses 58mm filters. Lens hoods must be removed to mount the filter, and then reattached, on all lenses except the 15 screw mount version - which has no provision for filters. Most lenses sandwich the filters in-between the lens and the lens hood. Push On Front Metal Caps: The Voigtlander screw mount lenses all use now discontinued push on metal front caps. There is a great deal of interchangeability. Most were available in either black or silver. 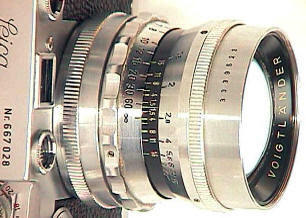 The metal caps were generally replaced by plastic snap on caps in the later M mount lenses. 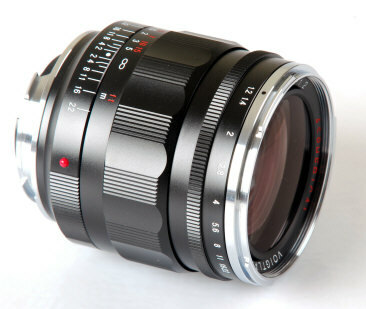 60mm Metal Push On Front Caps fit the Voigtlander 50/1.5 in Leica Screw mount or M mount, as well as fitting over the standard 35/1.2 Version I lens hood. 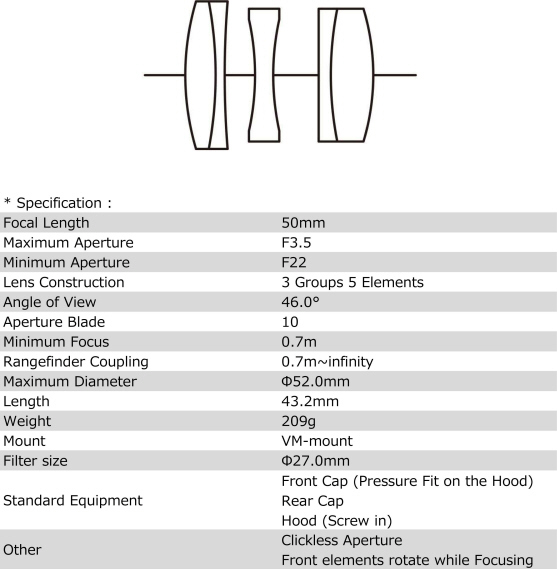 Rangefinder Coupling for confused newbies: The large majority of new Cosina Voigtlander lenses in Leica screw mount or Leica M mount are rangefinder coupled. This means as you turn the lens barrel, the rangefinder center patch in the camera's viewfinder moves to indicate accurate focus. The short story is that when you bring the two images together, the lens is in focus. Hoods: ALL the screw mount lens caps fit over the standard lens shade, not over the lens barrel. 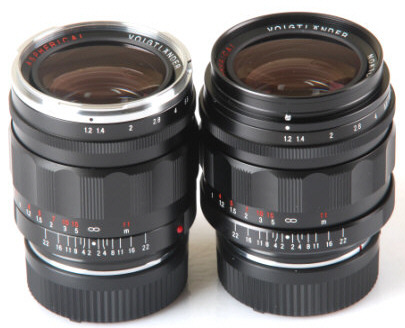 All Leica Mount Cosina Voigtlander lenses are sold with lens hoods, except the 35/2.5 P, 35/1.4, 40/1.4. The screw mount 12/5.6 is sold with a removable hood, which can be replaced by a 77mm filter holder. A non removable lens hood is built into the lens barrel of both the screw mount and Leica M mount version of the popular 15/4.5. The 21/4, 25/4, and 28/3.5 are sold with round hoods, but can be fitted with the optional square LH-1 hood. The 28/1.9 is sold with a removable hood. 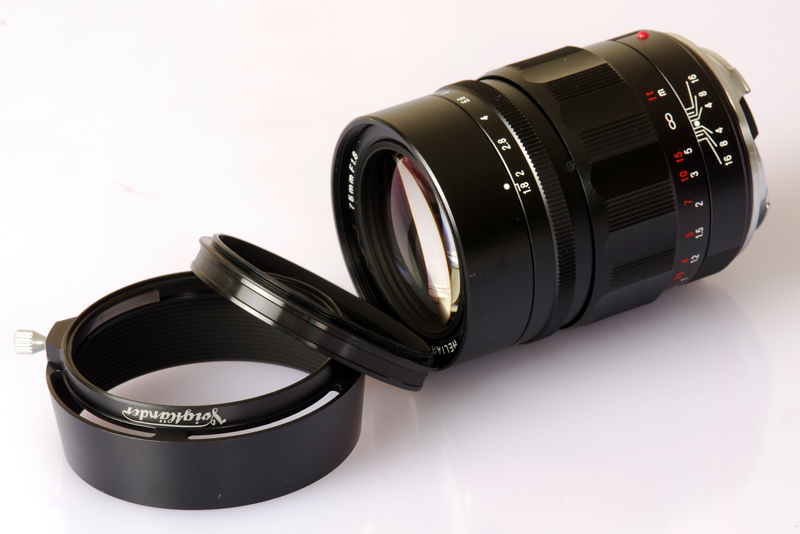 The 35/2.5 PI and PII lenses are sold without lens hoods. 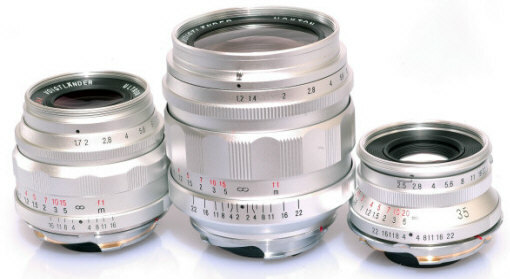 The 35/2.5C, 35/1.7, and 35/1.2 are sold with round lens hoods. 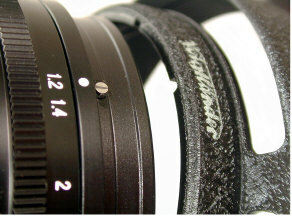 The 35/2.5C's round hood can be removed and replaced with the optional and larger LH-2 lens hood. 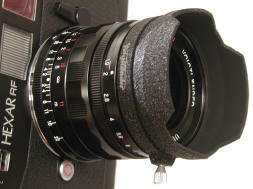 The 35/1.2's standard straight hood can be removed and replaced with the larger and vented Leica style LH-3 lens hood. The 50/3.5, 50/2, 50/2.5, and 50/1.5 are all sold with round lens hoods. Optionally, the M mount (but not the nickel) 50/2 will take the LH-4 vented hood, the 50/2.5 the LH-2 hood, and the 50/1.5 the LH-3 vented hood. The 50/1.1 is sold with a screw in lens hood, but the larger LH-7 is optional. The 75/2.5 and 90/3.5 are sold with lens hoods. To REMOVE the round lens hoods of the 21 to 50mm screw mount lenses, unscrew the lens hood with the lens cap ON, thereby taking off the lens hood and the lens cap together. 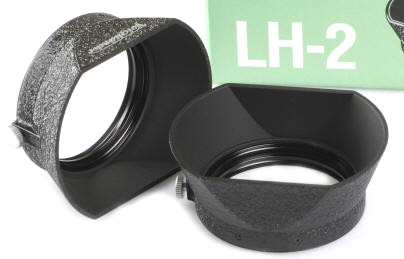 The LH-3, LH-4, LH-5, LH-6, LH-7, LH-8 are beautifully made vented Leica style metal hoods which allow you to look THRU the hood from the viewfinder. All bayonet securely and lock onto the lens. To MOUNT the bayonet lens hoods, line up the index mark on the hood with the index mark on the front of the lens, push in on the hood towards the lens, then rotate the lens hood to the right (as the lens is facing you) to lock down the bayonet. 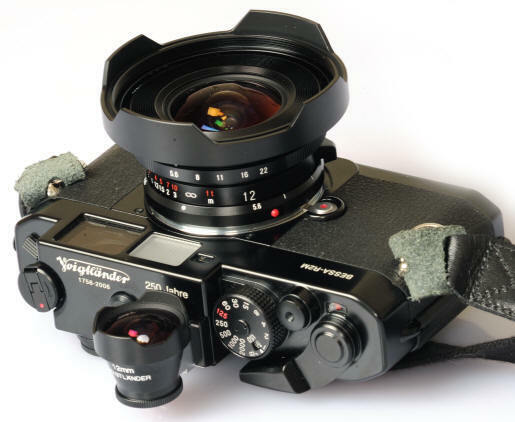 SFAIK, ALL the Voigtlander Leica Mount lens hoods are proprietary and will NOT fit lenses of other manufacturers, say lenses from a little town called Wetzlar. 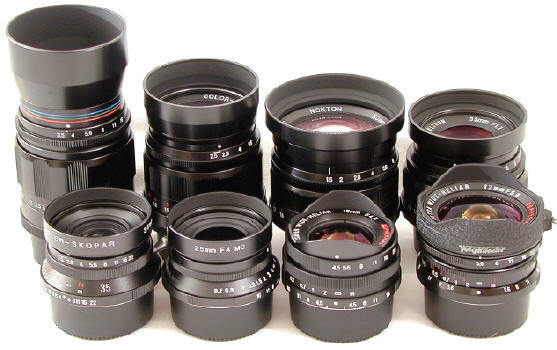 The only semi exceptions may be the Rollei RF 40/2.8 and 80/2.8 lenses which use Cosina produced lens barrels. 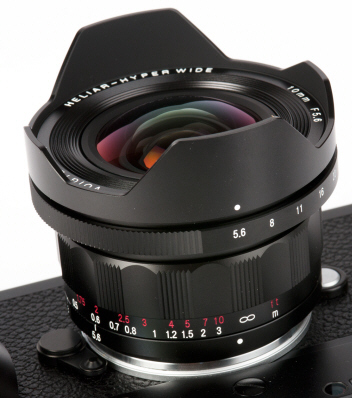 Viewfinders: The super wides screw mount 12/5.6, 15/4.5, 21/4 and 25/4 lenses are sold ONLY with the viewfinders. Viewfinders for the 28, 35, 40, 50, 75, and 90 are sold separately. The later M mount 12/5.6, 15/4.5, 21/4, and 25/4 are sold without viewfinders to allow shooters to match their viewfinder needs with the camera format of their choice. For info on the viewfinders and accessories, click here. Two 28mm viewfinders were produced. The original plastic bodied 28 viewfinder was replaced by the new classic style metal 28 viewfinder introduced with the 28/3.5 (available in black or chrome). 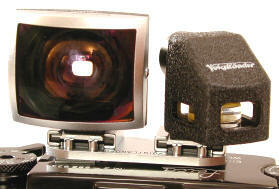 Likewise the original black plastic bodied viewfinder was replaced by the metal 35mm brightline finder (black or chrome) in March 2003 with the 35/1.2. 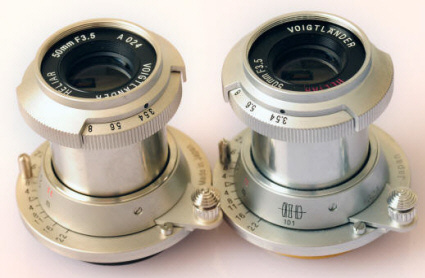 Two different style 50mm viewfinders were produced, the standard chrome or black 50 brightline, and the now discontinued 101 Heliar set 50mm brightline viewfinder. 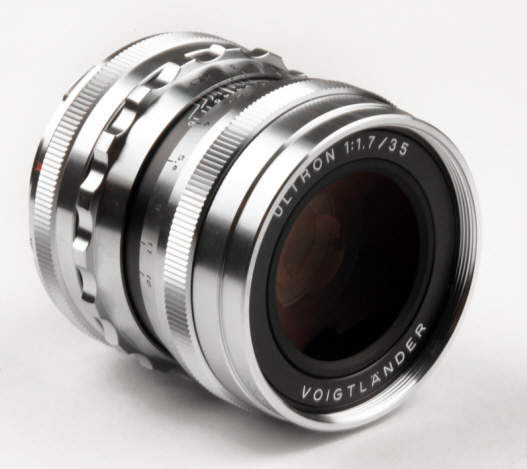 Voigtlander also makes a 40mm brightline for Leica CL or Minolta CLE owners who want to shoot their 40/2 on other M mount cameras. At PMA 2004 Voigtlander introduced the very compact 28/35 combination mini-finder - which is now sadly discontinued and in high demand. 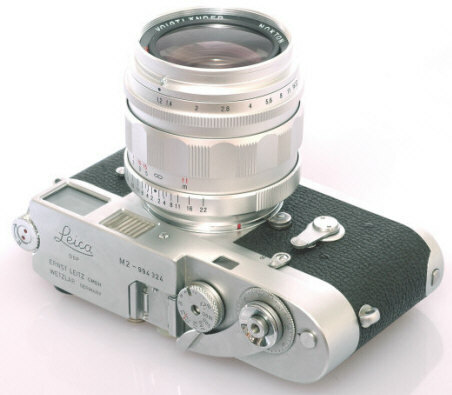 The mini-finder is especially good for the Leica M3, the screw mount Leica cameras, and the Voigtlander R3A and R3M. There are also special 12, 15, 21, and 25 viewfinders made just for the Epson RD-1. Late 2009 saw the introduction of the amazing 15-35 Zoomfinder. 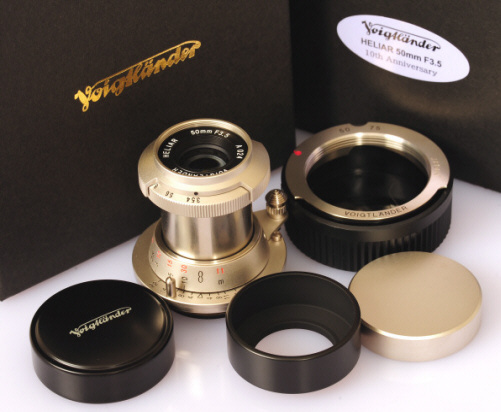 Add the special purpose low angle finders with 12, 15, 21, and 25 lens viewing attachments, and you will find today's Voigtlander accessory viewfinder lineup is the largest EVER offered by any 35mm camera manufacturer at the SAME point in time! 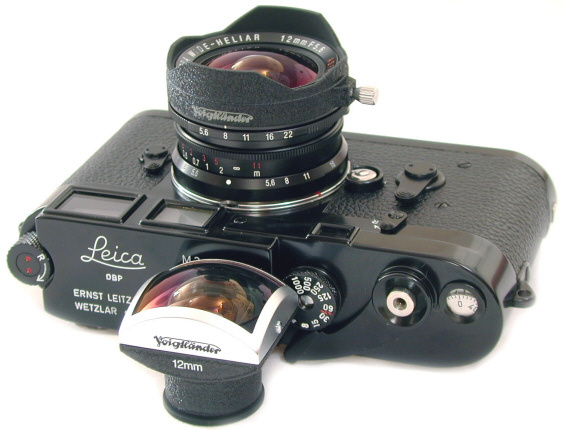 TWO LEICA RANGEFINDER LENS MOUNTS: It is important for newbie rangefinder nutz to be aware there are two Leica designed 35mm rangefinder mounts: the Leica Screw mount aka Leica Thread Mount aka LTM aka 39mm screw mount of 1931 and the Leica M bayonet mount of 1953. 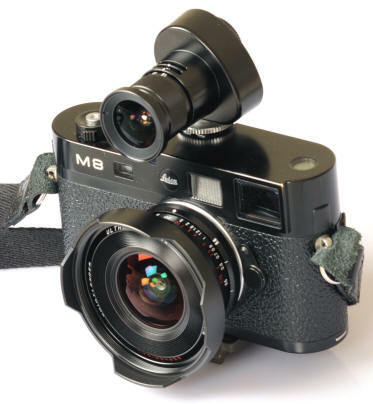 The screw mount lenses are perfectly compatible with the M mount bodies by adding a Leica designed screw mount to M bayonet adapter -- RF focusing is maintained. 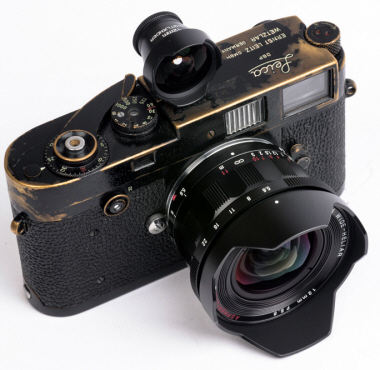 Voigtlander makes lenses in both Leica RF mounts. 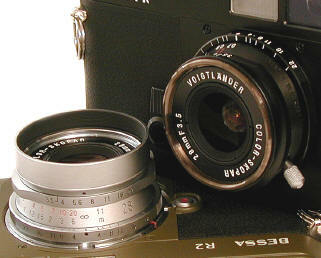 The Voigtlander 21/4P, 25/4P, 28/2, 35/1.2, 35/1.4, 35/2.5 Pancake Type II, 40/1.4, 50/2 collapsible, 50/1.1 and 75/1.8 are Leica M bayonet. The 12/5.6, 15/4.5, 21/4, 28/1.9, 28/3.5, 35/1.7, 35/2.5C, 35/2.5P1, 50/1.5, 50/2.5, 50/2 Rigid, 50/3.5, 75/2.5, and 90/3.5 Voigtlander are Leica screw mount, FULLY Compatible with Leica M cameras by adding the Leica designed screw mount to M bayonet mount adapter. Note the reverse is not true, i.e. 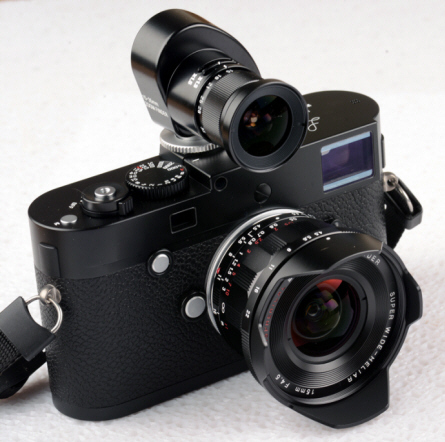 Leica M mount lenses can not be mounted on Leica screw mount cameras with any adapter. 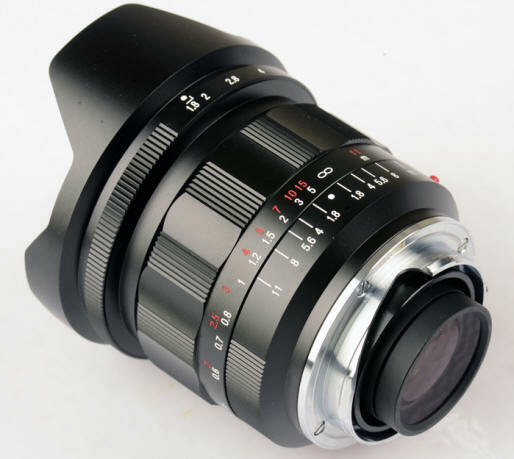 Therefore Leica screw mount lenses are considerably more versatile, as they will fit on hundreds of screw mount bodies which the M mount lenses can not take advantage of. 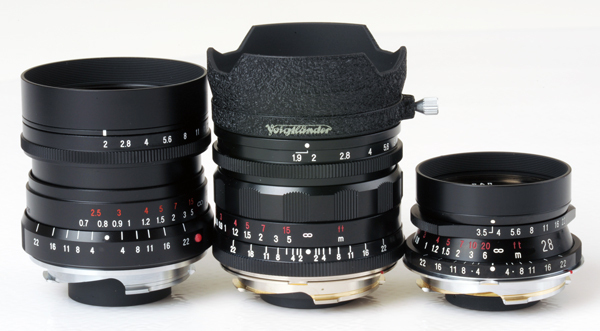 The full Voigtlander Leica mount lens lineup includes the 12/5.6, 15/4.5, 21/4, 25/4, 28/3.5, 28/1.9, 35/1.2, 35/1.7, 35/2.5 C, 35/2.5 P1, 35/2.5 PII, 40/1.4, 50/3.5, 50/2.5, 50/2, 50/1.5, 50/1.1, 75/2.5, 75/1.8, and 90/3.5. Which are missing from this pic? 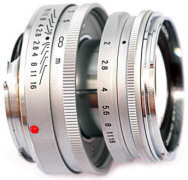 Cosina/Voigtlander produced the first quality Leica screw mount lens lineup since the discontinuation of the Canon screw mount lenses in the mid 1970's. 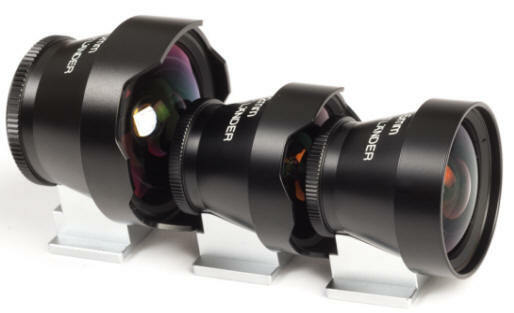 With modern optical designs and multi-coating, it's a fairly safe bet the new Voigtlanders are better lenses than any of the older classic Leitz, Nikkor, or Canon screw mount lenses. 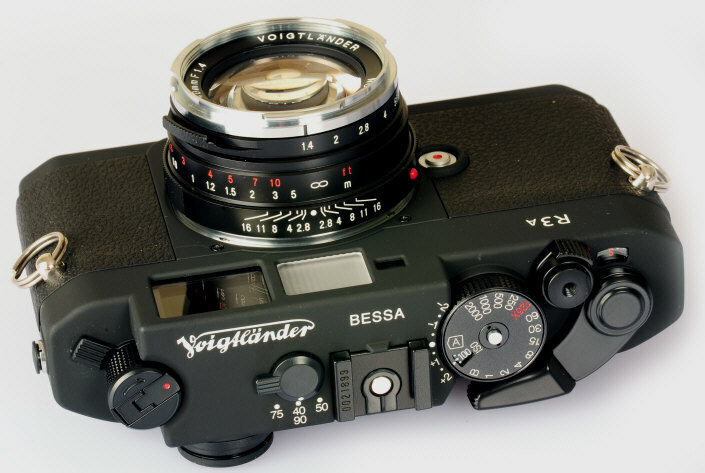 In January 1999 Cosina introduced the Voigtlander Bessa L, ironically the first Voigtlander camera in Leica Screw Mount, with the 15/4.5 Aspherical Heliar and 25/4 Skopar -- both of which require separate finders. 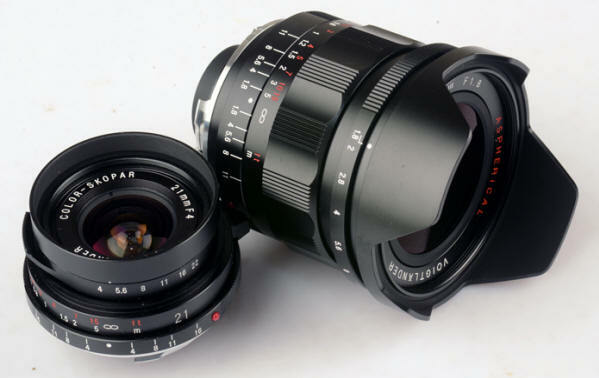 The 15mm Heliar had the honor of being the widest lens ever made in Leica Screw mount, until the even wider 12/5.6 Voigtlander Heliar. For this long time Voigtlander fan, it is a real treat to see that venerable and honorable name once again in production. 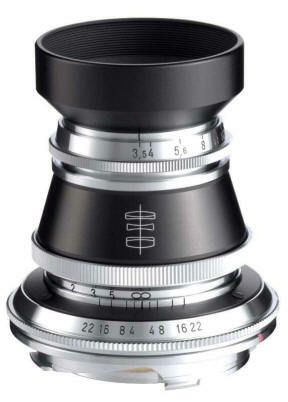 In August the 35/1.7 Aspherical, 50/1.5 Aspherical, and 75/2.5 were announced. 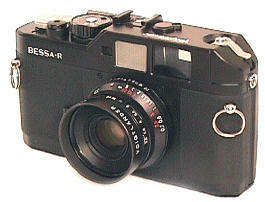 By March 2000, the Bessa R with rangefinder added along with two new lenses, the 35/2.5 "Pancake" and 35/2.5 "Compact." The incredible 12/5.6 rectilinear super wide went on sale 9/1/2000. 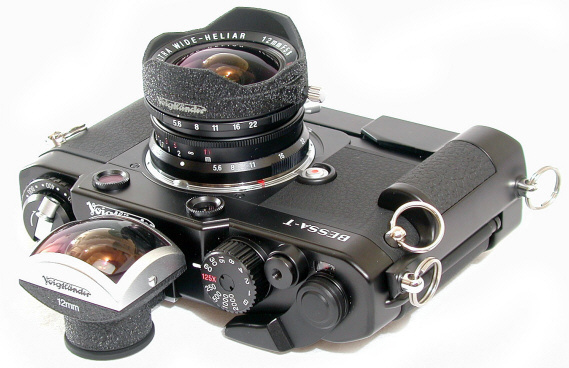 The 50/3.5 Heliar was introduced with the 101'st Bessa T Anniversary set in November 2001. 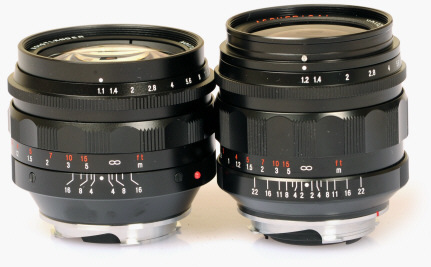 The compact 50/2.5 and 28/3.5 were announced in March 2002. The 35/1.4 was announced January 2008. 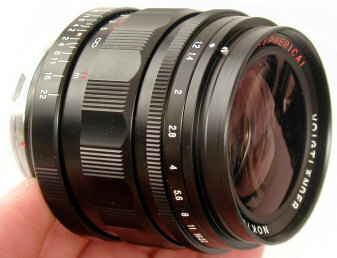 The 75/1.8 was announced August 2010. 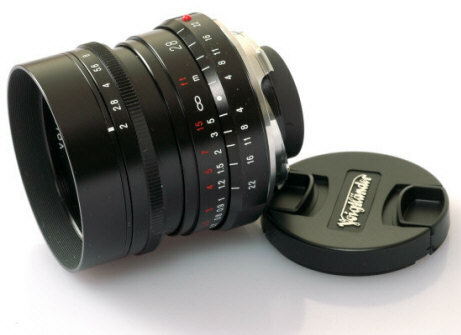 All Voigtlander screw mount lenses are usable on all Leica Rangefinder cameras, whether M or screw mount. Shown above is the Voigtlander 50/1.5 Nokton mounted on a M mount Leica M6 and on a screw mount Leica IIIf. Mount screw mount lenses directly on "Barnack" Leica Screw mount bodies, or mount them on Leica M bodies with Screw Mount to M adapters. 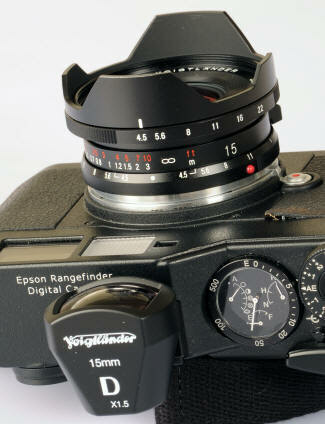 Rangefinder coupling is maintained if the lens is rangefinder coupled -- the 12, 15 and 25 super wides are not. 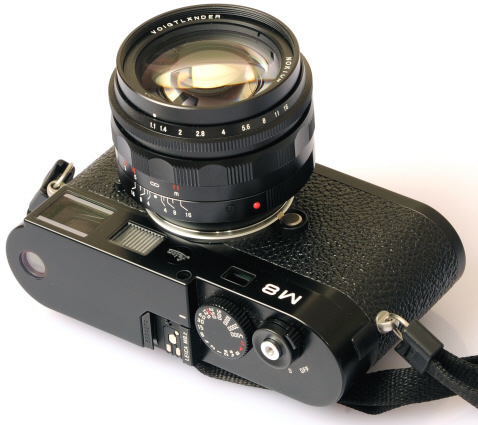 Unlike some wides, the 12, 15 and 25 can be used on the M5 or CL without damage to the metering cell. Likewise, all can be used on the Minolta CLE with Screw Mount to M adapters. 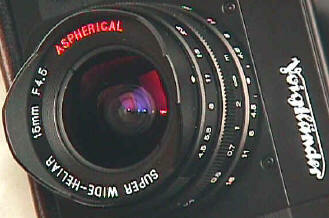 Shown above is the 50/1.5 Aspherical Nokton mounted on a M6 Titanium and on a IIIf. 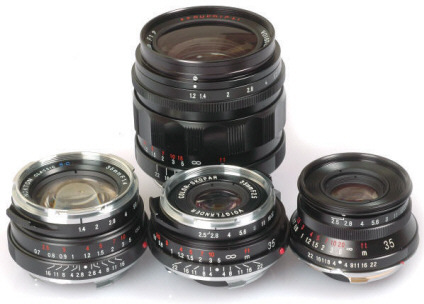 Collectors: I believe the 15/4.5, 25/4, 50/1.5, and 75/2.5 lenses were made under the Cosina brand name for some markets, before they were discontinued due to Voigtlander brand name popularity. 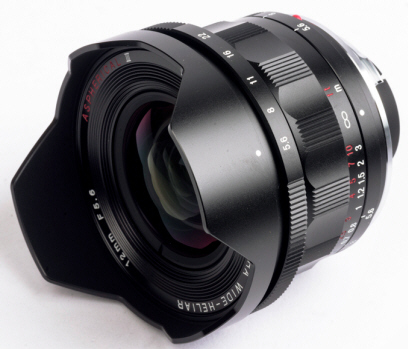 The performance and prices of the new Leica screw mount Voigtlander lenses are quite simply incredible. 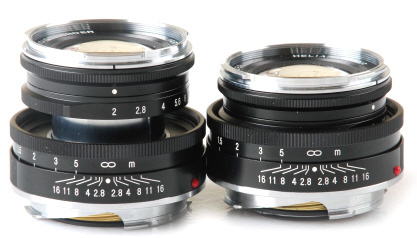 There are no better buys in terms of performance per dollar in Leica Screw Mount lenses than these. If you are new to rangefinderdom, let me assure you that all of these lenses will work beautifully on any classic Leica screw mount camera (including the knob wind Leicas, all but the earliest Canon Rangefinders, various "Leica Copies" such as Nicca and Leotax, and the fabulous Leica M's if you add a screw mount to M bayonet adapter. Revised: January 13, 2019 . Copyright © 1996-2018 Stephen Gandy. All rights reserved. This means you may NOT copy and re-use the text or the pictures in ANY other internet or printed publication of ANY kind. Information in this document is subject to change without notice. Other products and companies referred to herein are trademarks or registered trademarks of their respective companies or mark holders.